The operation "Strengthen the arm of Liberty"
Nowadays a lot of these statues were destroyed, but there are still nearly half. They are often found outside city halls (City Hall) or equivalent department of our hotels, lodges County (County Hall). Sometimes they are in court, or more anecdotal in parks, which is still quite common. Note artistically, they do not comply. They have a crown of rays too long, too constricted, and the face is too juvenile, too round. They are 8 and a half feet and weighs 290 pounds. The list below shows many of the remaining statues. Can not be fully exhaustive as these statues are sometimes displaced or replaced, so make accurate tracking is ambitious. But this list comes close. 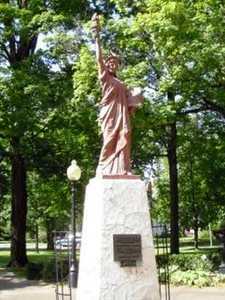 Replica of the statue of Liberty at Fayetteville (Arkansas, United States). 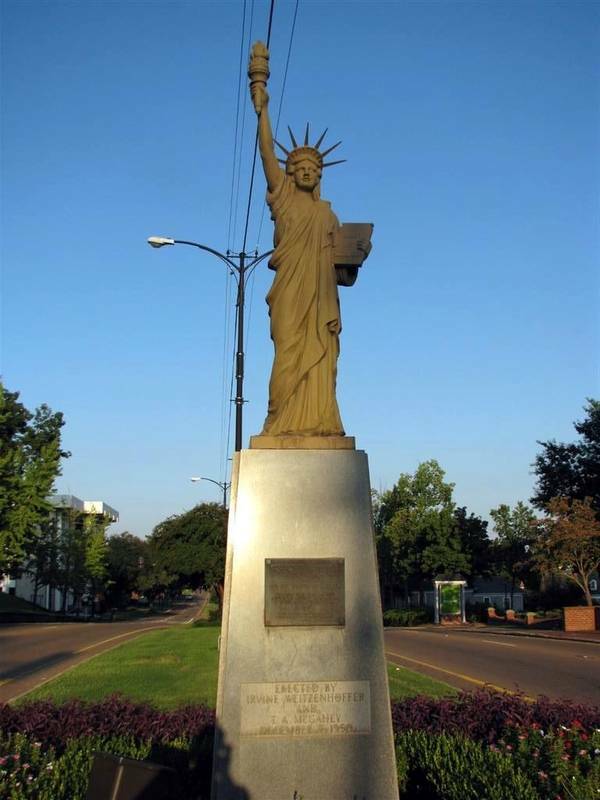 In Arkansas there is another statue of liberty after the installation campaign replicas everywhere on the American territories. It is in the city of Fayetteville, before the "Washington Regional Medical Center." It has three bases that overlap, the first two and the third cylindrical square, while three red brick. 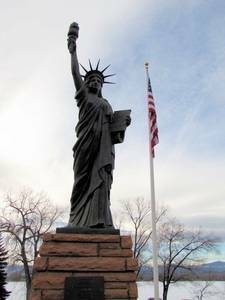 Replica of the statue of Liberty at Fort Collins (Colorado, United States). This is another replica set up by Whitaker in 1950 across the US territories. It was mounted on a massive pedestal, brown stone. She's in Fort Collins, Colorado. 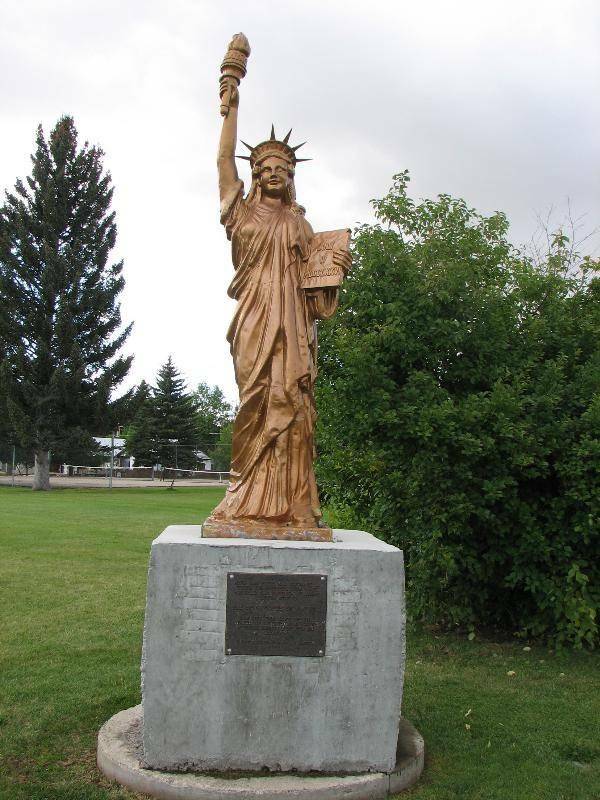 Replica of the statue of Liberty at Greeley (Colorado, United States). This reproduction of the Statue of Liberty is in Greeley, Colorado. It is in front of the hotel Weld County, on the outer lawns. It looks like two drops of water to the statues in place during the campaign scouts in 1950 but its uniform green advocates a more recent installation, you do not really feel she is so old only that. However its shape and the way it takes the tablet indicates that it dates much of that time. It is on a pedestal shaped like a truncated pyramid. 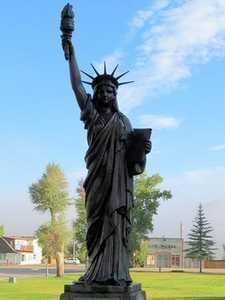 Replica of the statue of Liberty at Kremmling (Colorado, United States). Like other 200 copies, this statue was set up to celebrate the 40th anniversary of American scouts. It is located in Colorado, in the town of Kremmling. It measures approximately 8 feet and a half high and is covered with copper plates and weighs 290 pounds. 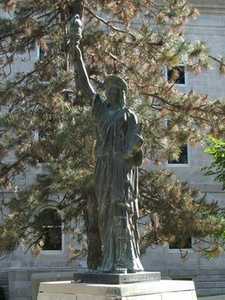 Replica of the statue of Liberty at La Junta (Colorado, United States). 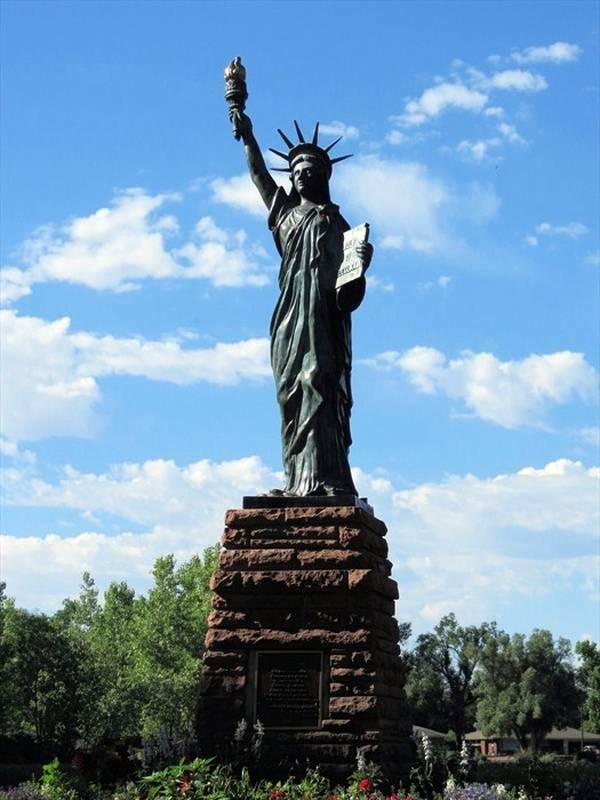 Replica of the statue of Liberty at Lake Loveland (Colorado, United States). Another copy of the Statue of Liberty after the campaign of Boy Scouts 1950. This is in Lake Loveland, Colorado, specifically just near the lake aquatic facilities. Its pedestal is covered with limestone, which gives a fairly successful together. 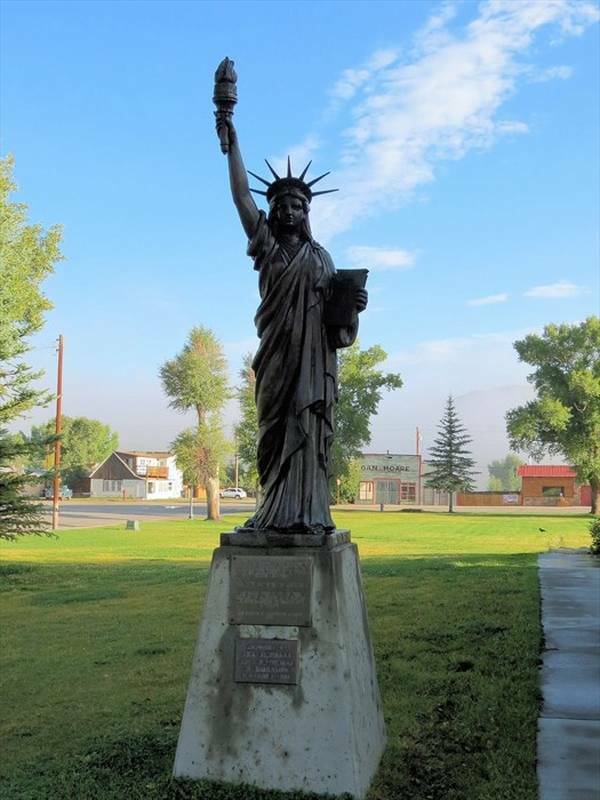 Replica of the statue of Liberty at Trinidad (Colorado, United States). This copy is in very good condition, it has withstood the ravages of time. It is in a street of the city, on a rather high pedestal. 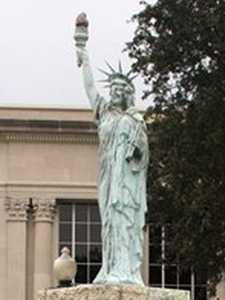 Replica of the statue of Liberty at Wilmington (Delaware, United States). Another replica is located in Wilmington. It is nicely preserved, and it was restored relatively recently. It is located in the city center, in Wilmington, Delaware. 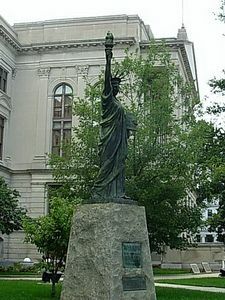 Replica of the statue of Liberty at Atlanta (Georgia, United States). 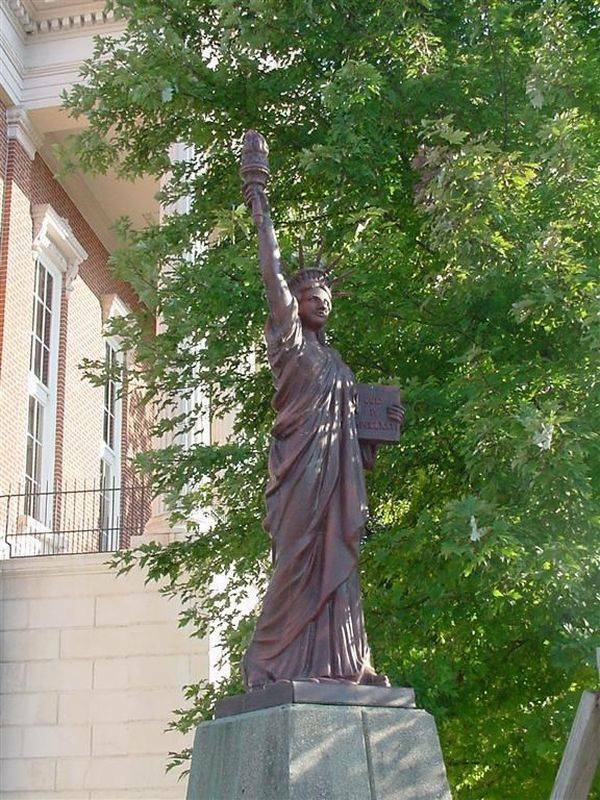 This statue is on the lawns of the Capitol in Jefferson County, in the northwest corner. It was donated by the American Boy Scouts in Atlanta Board in February 1951. She was put on a pedestal rather imposing but well proportioned. 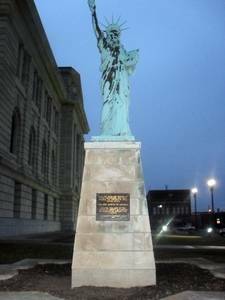 Replica of the statue of Liberty at Dubuque (Ioha, United States). 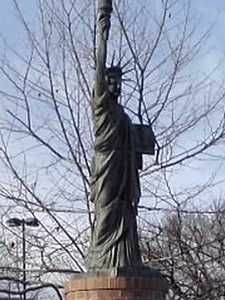 Another replica of the Statue of Liberty after the campaign of 1950. This scouts is well preserved, it is covered with copper and sits on top of a pedestal shaped like a truncated pyramid, concrete pedestal . Geographically it is in Dubuque, Iowa, in Washington Square, bordered on the north by the 7th street to the east by Bluff Street, south by the 6th, and on the West by Locust Street. 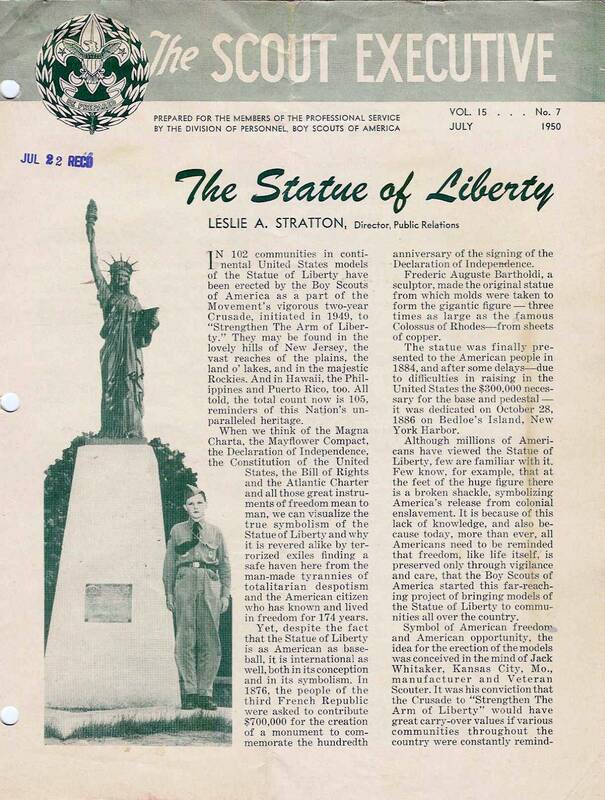 The statue was donated by William V. Toepel in memory of her son who gave her life 29 June 1944 to assist in the preservation of freedom in the World. 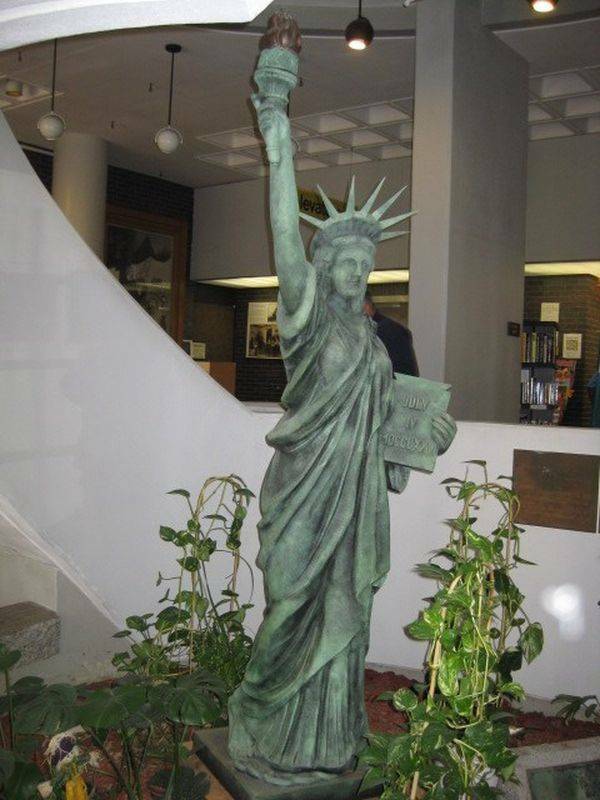 Replica of the statue of Liberty at Woodbine (Ioha, United States). If there is still a hundred statue of boy scouts, those dating from the 50s, many have a base in the shape of stars, recalling the foundation of the original statue. That is the case here, the star protecting the pedestal shaped like a truncated pyramid, all brick and stone. The statue itself is covered with plates follow. Like the others it makes a little more than 8 feet high and it was inaugurated in 1951. It is located in the park of the library Woodbine, next to a barrel of the nineteenth century. 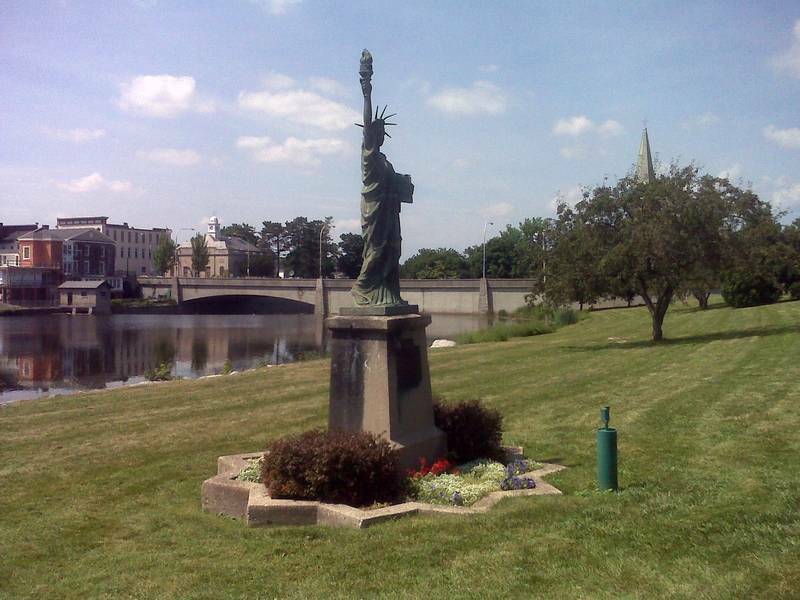 Replica of the statue of Liberty at Warsaw (Illinois, United States). 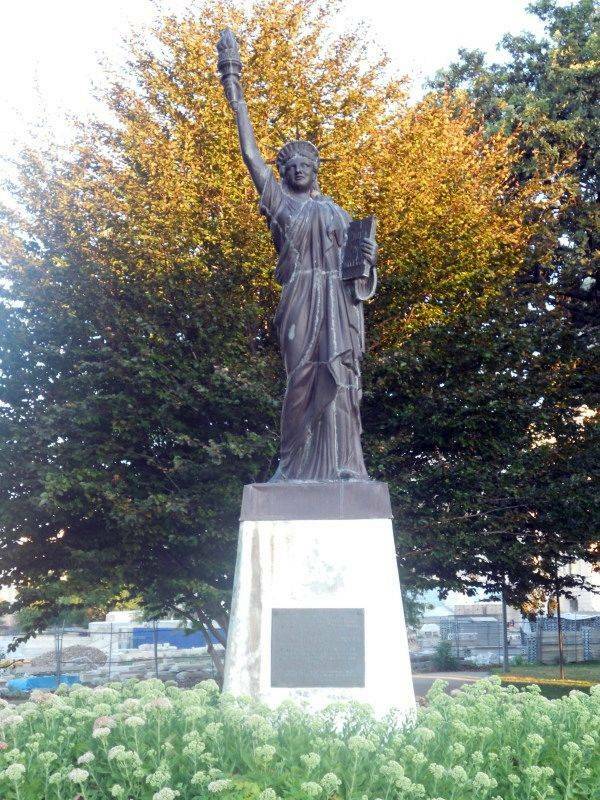 In Illinois, the visitor can see the copy of the statue in the city of Warsaw, exactly in the city park. It is identical to the other statues set up by scouts in 1950. This one is a gift from Frank H. Connor, it was inaugurated in 1950. It is perched on a pyramid pedestal pretty simple but the concrete brings into focus. It is copper color, which proves that it has been renovated fairly recently, oxidation has not yet occurred. 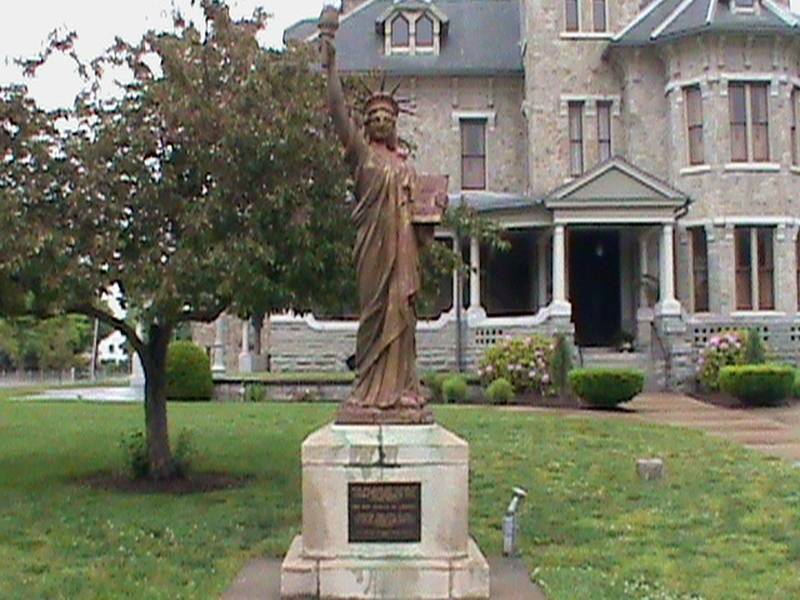 Replica of the statue of Liberty at Madison (Indiana, United States). 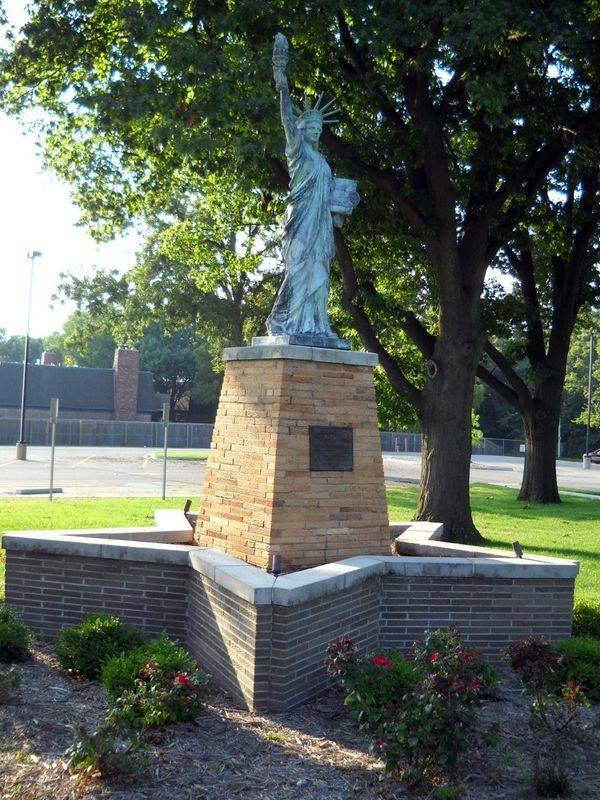 This statue is part of the list of replicas offered by the American Boy Scouts in the 50 It is located in Madison, corner Northwest Hotel Jefferson County, Indiana. It is fairly well preserved. 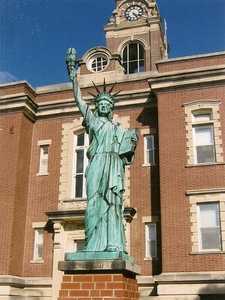 Replica of the statue of Liberty at Gary (Indiana, United States). This replica of the statue has been established for 40 years Boy Scouts of America. 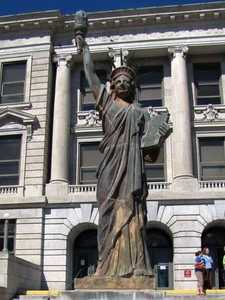 She was put in Gary, Indiana, in the street leading to the town hall (City Hall). It measures 8 feet high and has a narrow, tall stone base. A plate on the plinth recalls the events of her erection. She wrong time, the crown is damaged, one of the spokes is crooked. 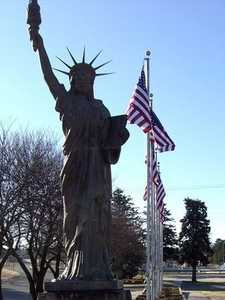 Replica of the statue of Liberty at Leon (Indiana, United States). 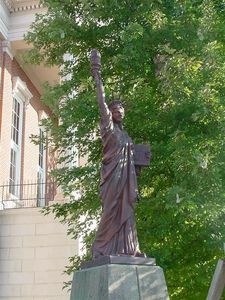 This replica is one of the statues set up by scouts in the 50 It is in the courtyard of the court of the city of Leon, in the county of Decatur (Indiana). 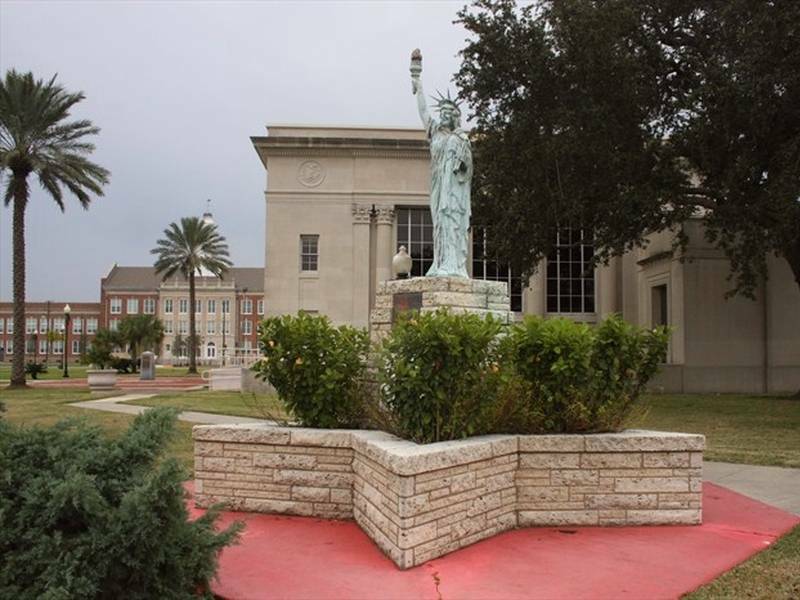 Its exact address is Main Street, between 2nd and 3rd Street courthouse lawn, Leon. 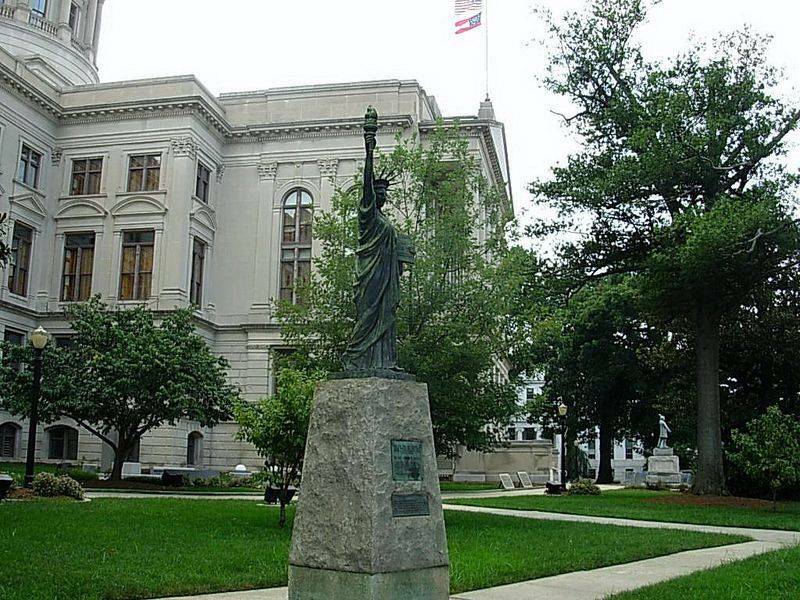 It was restored and opened in 1976 and in 2003, the first time by the US bicentennial committee, the other by the proposed restoration of the statue of liberty of Decatur County. 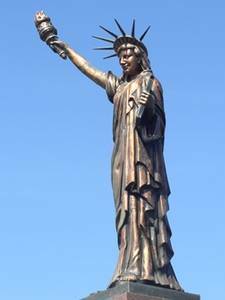 The statue is mounted on a pyramidal pedestal with a plate on the front side. 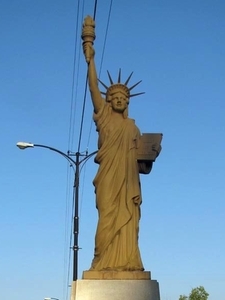 Replica of the statue of Liberty at Peru (Indiana, United States). 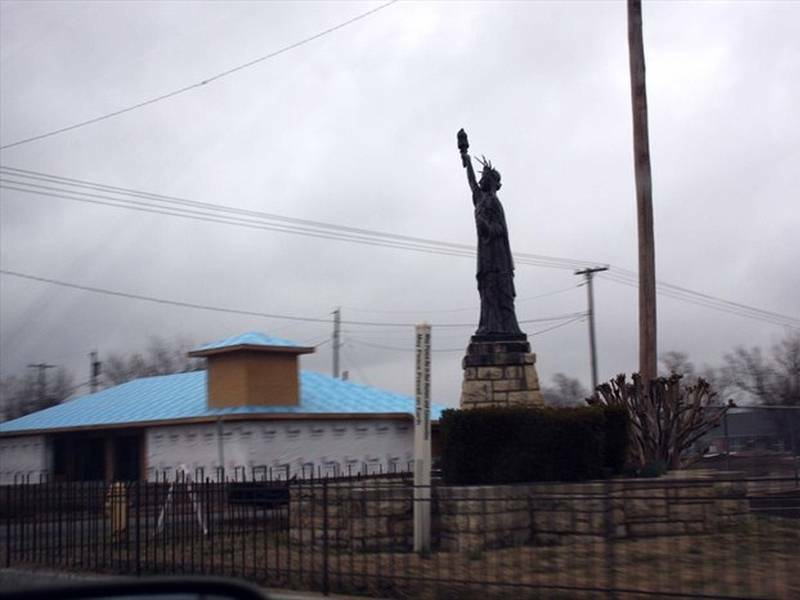 This reproduction of the Statue of Liberty is located in Peru, a town of Indiana. She's out front of Miami County, on the south lawn. 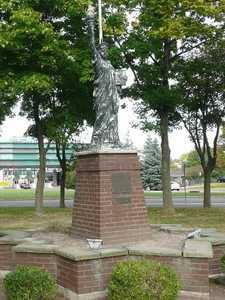 She is one of many statues that were in place during the campaign scouts in 1950. It was inaugurated in 1951. 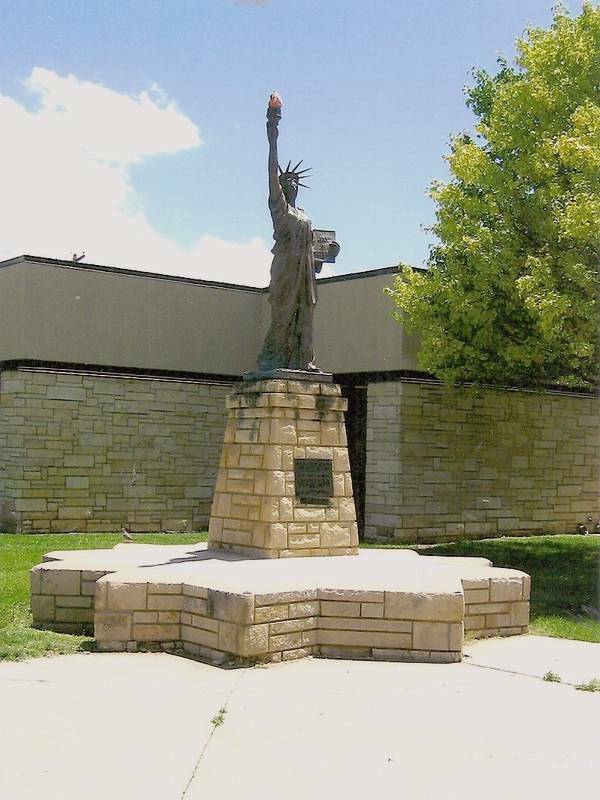 Replica of the statue of Liberty at Harlan (Kansas, United States). This statue of the series of American Boy Scouts, made in 1950, is particularly well preserved. It was probably recently renovated. 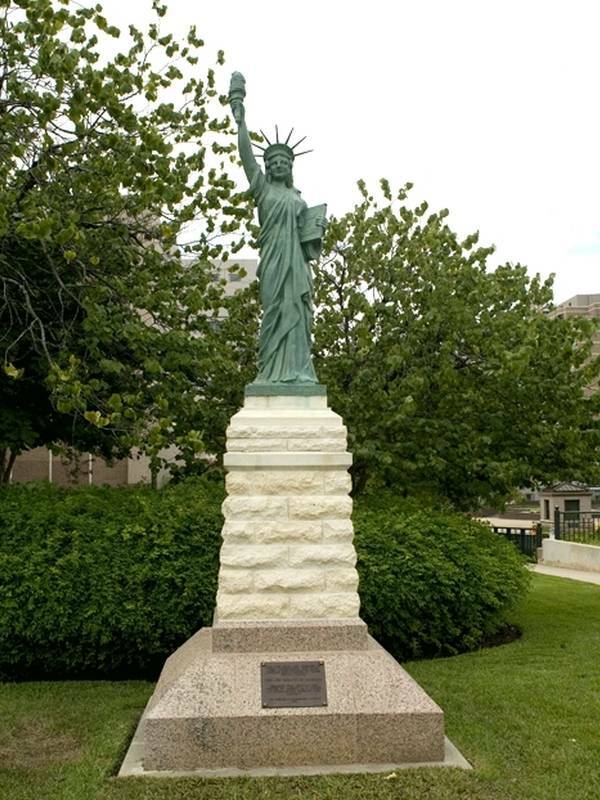 It is located on the lawns of the Doniphan County Courthouse in Troy (Kansas). Opened September 15, 1950, it was restored and re-opened in 2005. It is on a pedestal too big for her, a concrete block in the shape of a truncated pyramid covered with limestone. Replica of the statue of Liberty at Hays (Kansas, United States). 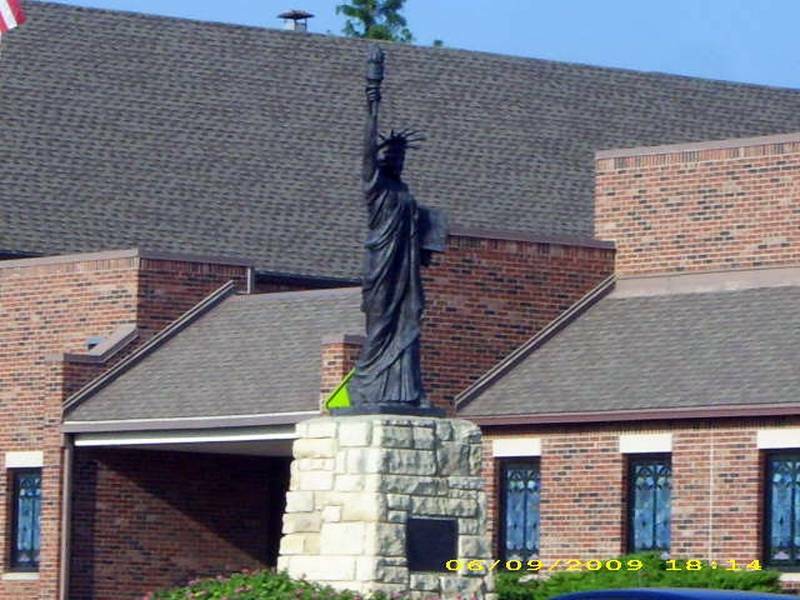 Replica of the statue of Liberty at Independence (Kansas, United States). 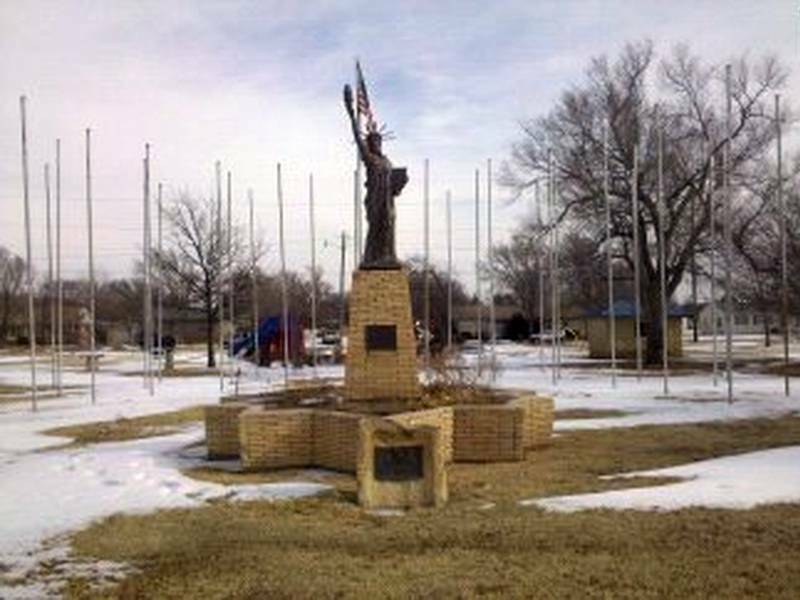 This replica has been put in place by the Boy Scouts in 1952 in the town of Independence, Kansas. Originally the town hall, near the police station, she was moved along the police premises under the "Civic Center". The inauguration took place on 17 February 1952 and was then inaugurated again February 9, 1984, just after it moves. 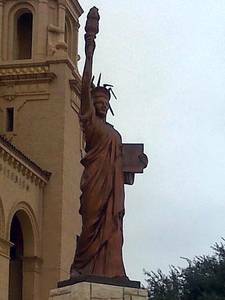 Today she is still there, Locust Street, in front of the "Civic Center". This statue has nothing original in comparison with others of that time, except that the pedestal is particularly successful, in apparent limestone and decorated with flowers. The statue is illuminated at night. 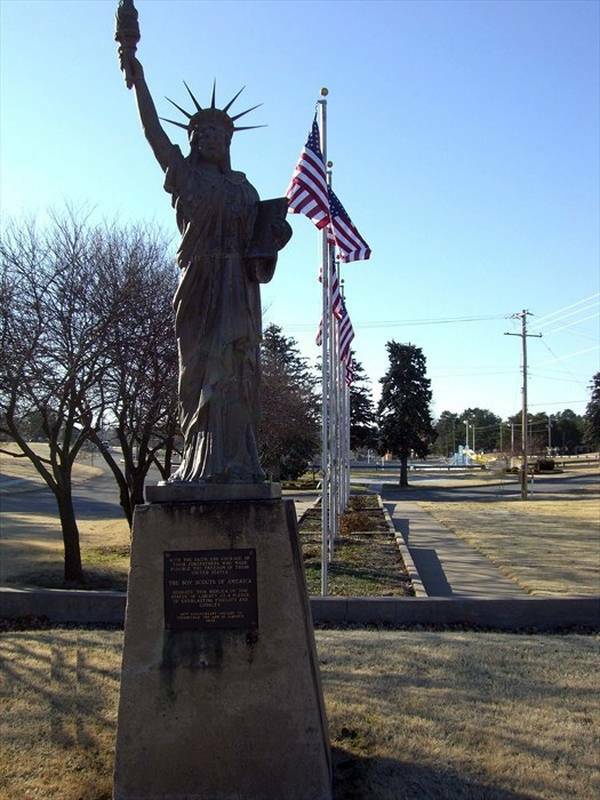 Replica of the statue of Liberty at Kingman (Kansas, United States). 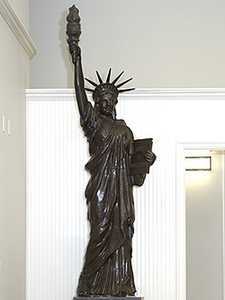 This reproduction of the Statue of Liberty appears to be part of the 100 remaining statues Campaign Boy Scouts in 1950. It is located in Kansas, to Kigman. 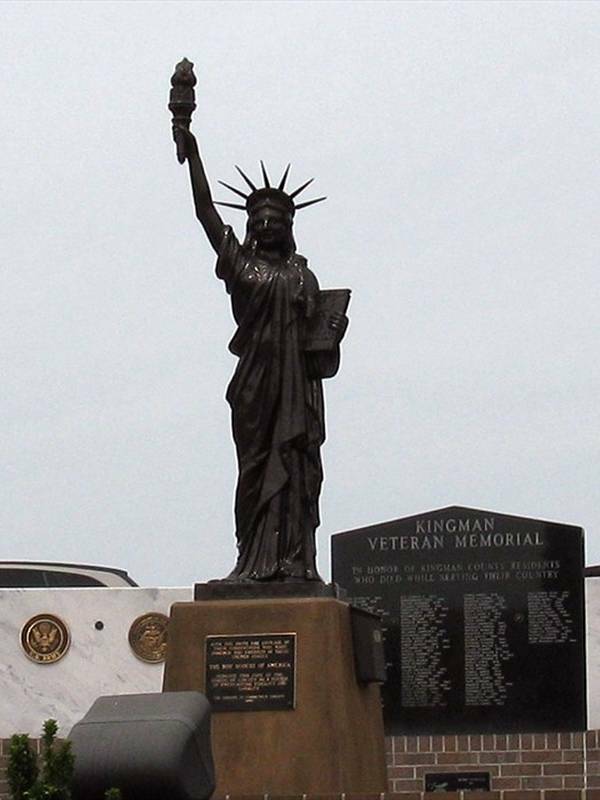 It serves as a memorial to veterans, a very common monument in American cities. Kingman is that of the Main street angle and Highway 14. It does characterized by particularly others in this series. 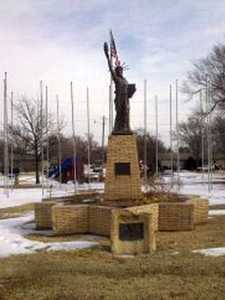 Replica of the statue of Liberty at Lacrosse (Kansas, United States). 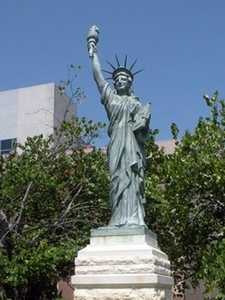 Another very beautiful statue, after the long list of replicas in place by American scouts in 1950-51. This is not very different from others, if not on a pedestal it is very well done in beige brick pedestal itself placed on a pedestal recalling the star fort Wood fort on which was erected the original statue. 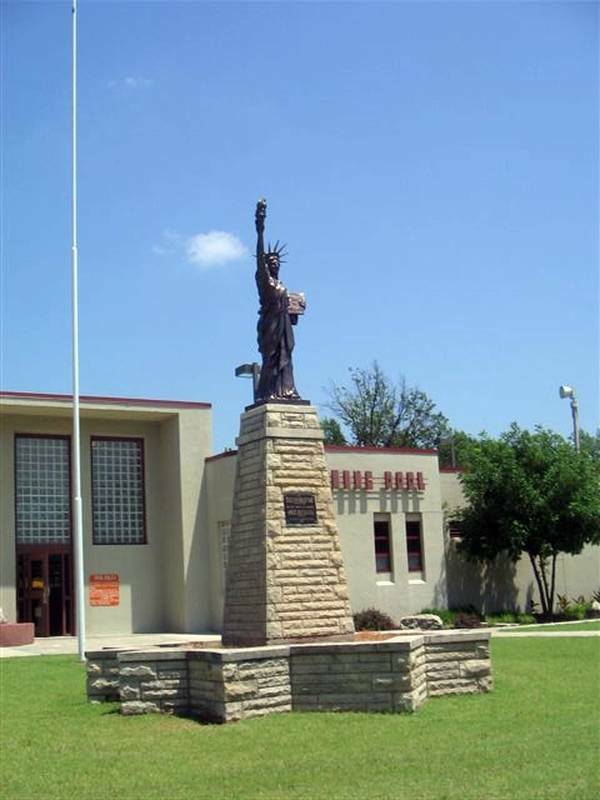 Note that the plane of this base was used again, this is exactly the same as the statue of Hays, still in Kansas. 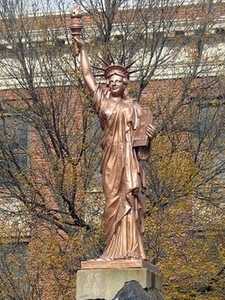 The address of this statue is 400 Main Street, La Crosse, KS. 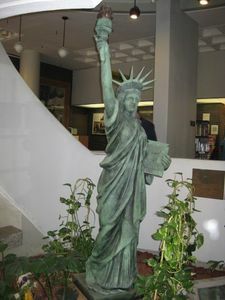 Replica of the statue of Liberty at Liberal (Kansas, United States). 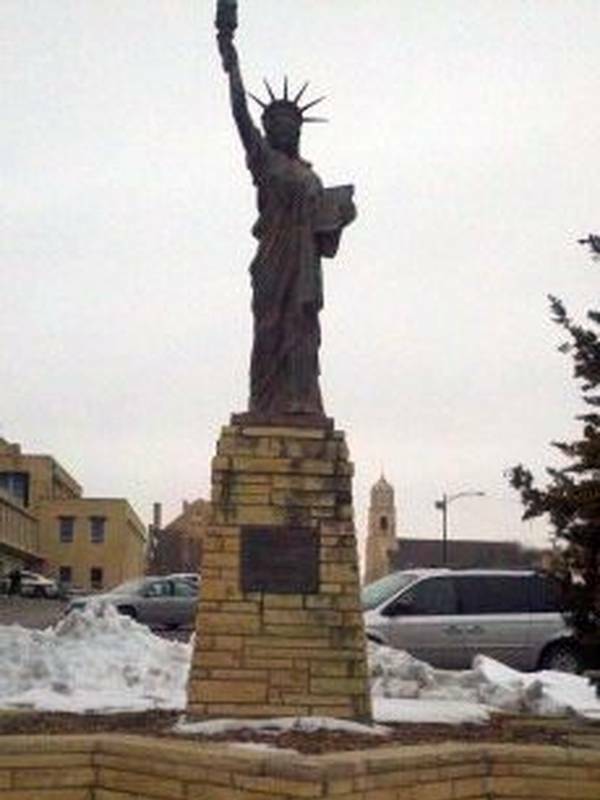 This copy of the Statue of Liberty is located in the town of Liberal, Kansas. It is consistent with other copies of that time (1950). This is a gift of Mr. and Mrs. Baty on behalf of American scouts. Its exact address is 519 Kansas Avenue, library lawn, Liberal. 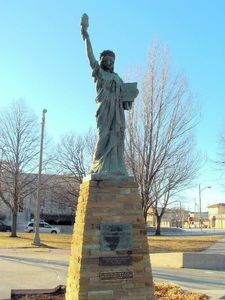 Replica of the statue of Liberty at Platt (Kansas, United States). 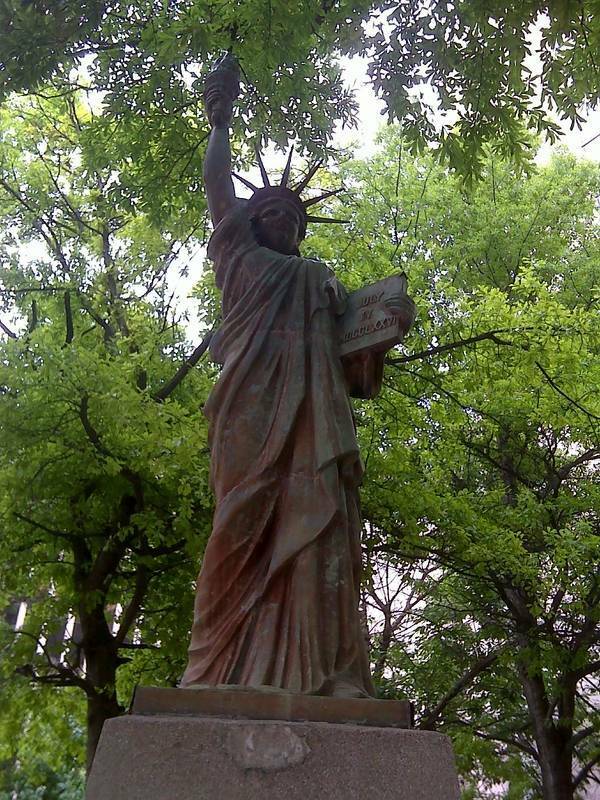 It is in the city park of the city of Platt, Kansas, found this miniature version of the Liberty Island in New York. It was installed as her 200 counterparts between 1950 and 1953. That one, exactly in 1950. It is a truncated pyramidal pedestal at the top of concrete, simple enough. 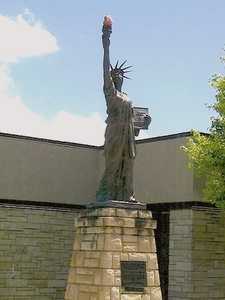 Replica of the statue of Liberty at Shawnee Mission North (Kansas, United States). Shawnee Mission North is a city of Kansas. On the campus of the school is one of many aftershocks installed by American scouts in 1950. It is in the western part of the campus. The address is 7401 Johnson Drive. 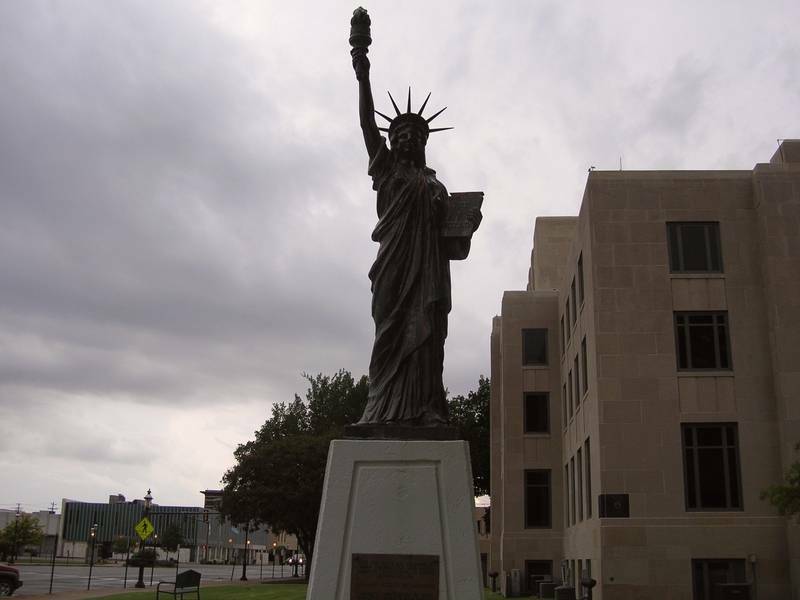 Replica of the statue of Liberty at Topeka (Kansas, United States). The city of Topeka, Kansas, has its replica scouts, she was setting up like others in the early 50. Here she is in the park capitol of Kansas, the equivalent of our Parliament . We are in the city center course. Its pedestal is unsightly, it is a simple truncated pyramid of concrete painted white, which will deserve to be extensively renovated. 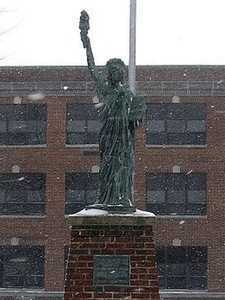 Replica of the statue of Liberty at Lawrence (Massachussetts, United States). 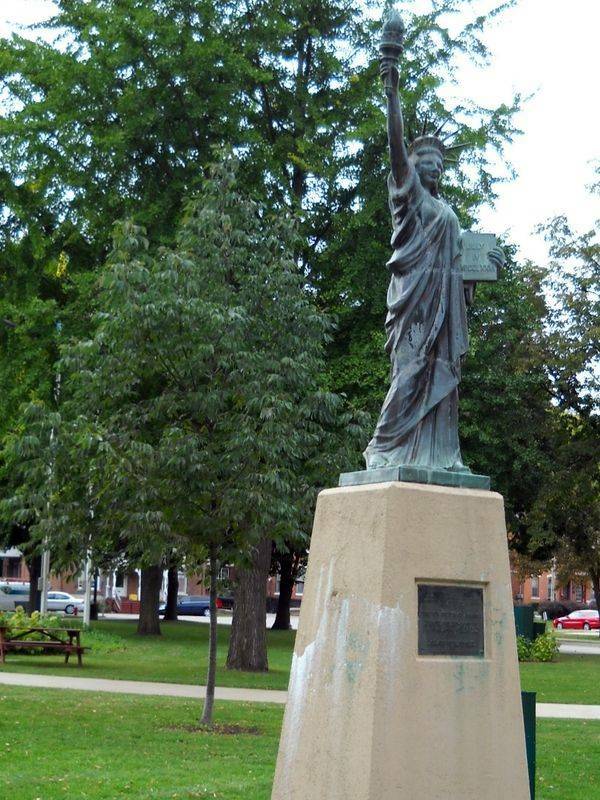 This statue is, despite what you see, one of the replicas established by the Boy Scouts in 1950. 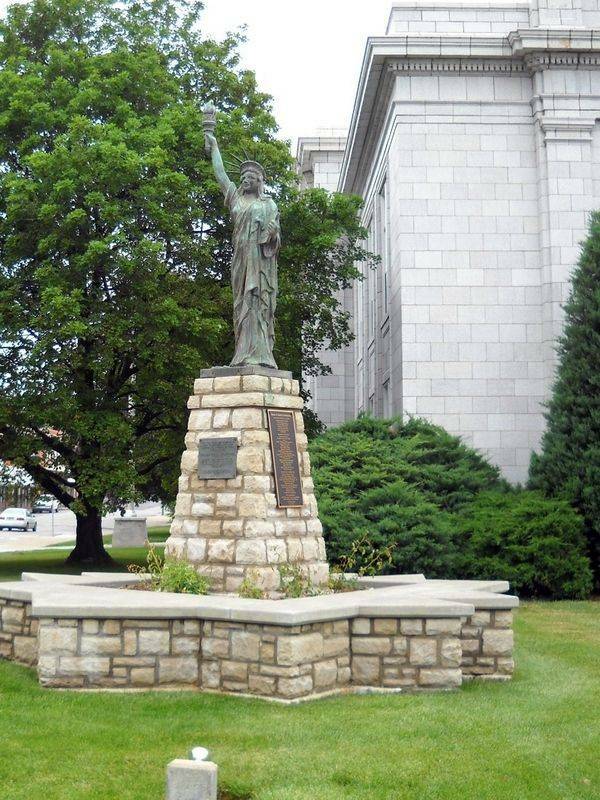 Besides her plaque recalls: "Jack Whitaker, the Boy Scout Comissioner for the Kansas City Area Council , and a local businessman, started a program to celebrate Scouting's 40th anniversary theme, "Strengthen the Arm of Liberty" by selling thesis statues. They are 8 '4 "tall, made of copper, goal APPEAR more like a bronze casting. 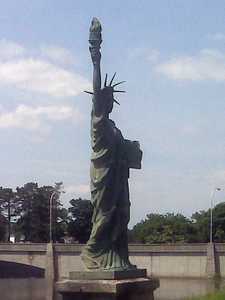 Braced from the inside, and usually set on a star shaped based, much like They APPEAR the original in New York harbor. The arm is at a different angle than the Slightly original, and there is usually a plate in the base giving the Boy Scouts mention. 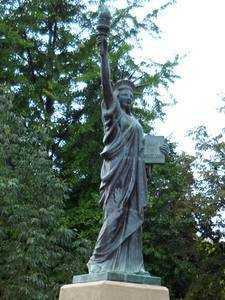 The statues Were manufacured by Friedley-Voshardt Co. of Chicago, IL, and weigh about 300 lbs. Most of the statues Were you purchased through the Kansas City Boy Scouts for about $ 350. " It was set up initially at the main library, but it was moved to the new premises of the library in 1972. She is a little different from the others, she had to undergo a renovation "hussar". Her face is no longer quite the same, for she kept against her frail body. 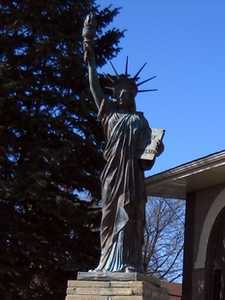 Replica of the statue of Liberty at Holly (Michigan, United States). 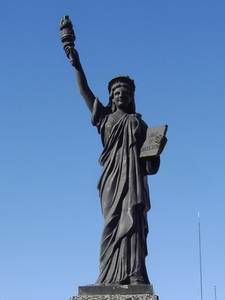 The city of Holly has two replicas of the Statue of Liberty, is a curiosity for a city not so big. The first belongs to those installed during the campaign of Boy Scouts in 1950. It is located in front of the 'Cole Lake Quonset Hut'. Its pedestal is quite large, probably too big for a statue of only 6.5 feet tall. 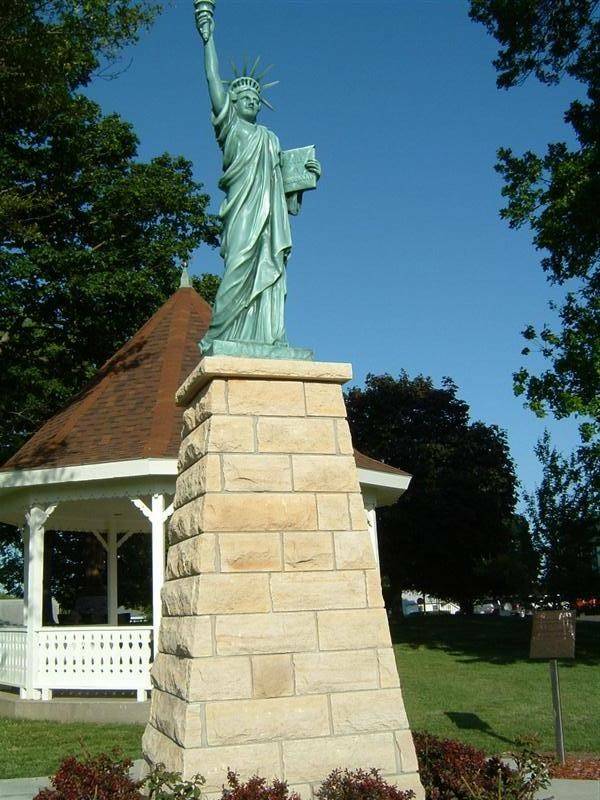 Replica of the statue of Liberty at Jefferson City (Michigan, United States). This replica of the 50 part of the list that emitted by the Boy Scouts during the operation "Strengthening Freedom arm." This statue has survived not too bad, it is fairly damaged. like the other she has her faults, but one in the other it is rather nice to see. It is located on the lawns of the Capitol of the State of Missouri in Jefferson City. Its pedestal, for against, is not great: very big, massive, some maintained, it distorts the statue itself. 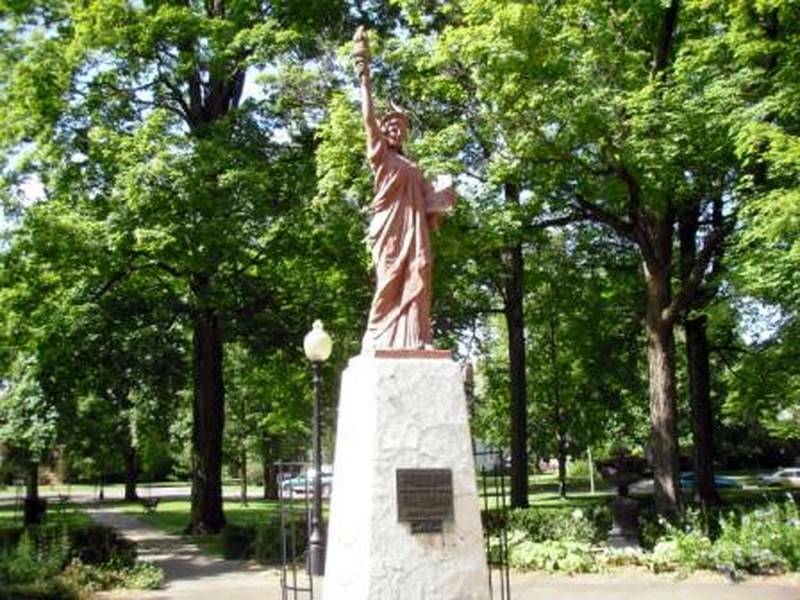 Replica of the statue of Liberty at Columbus (Michigan, United States). Very nice statue outcome of the campaign of American Boy Scouts in 1951. It has a perfect coppery color, it is built on a rather imposing concrete pedestal. It was offered by Irvine Weitzenhoffer in December 1950. It is located median Street - Main Street, in Columbus, Mississippi. 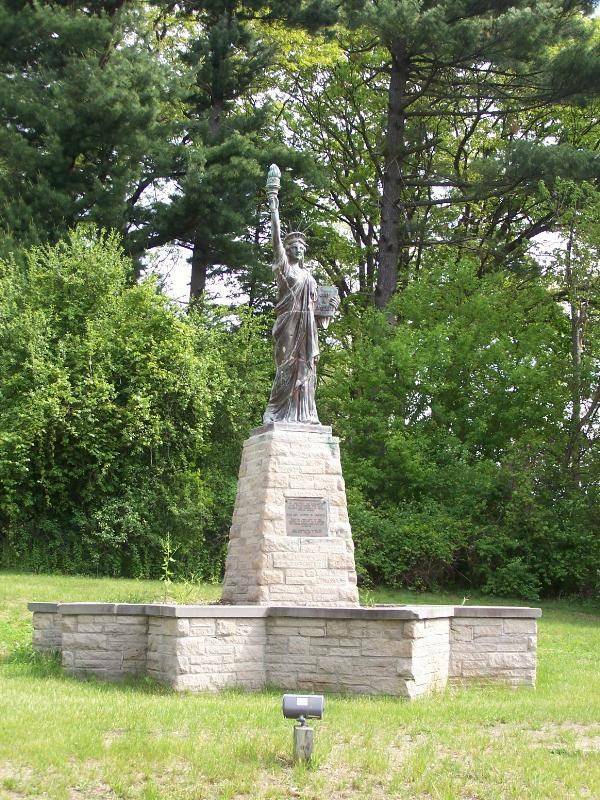 Replica of the statue of Liberty at Springfield (Michigan, United States). 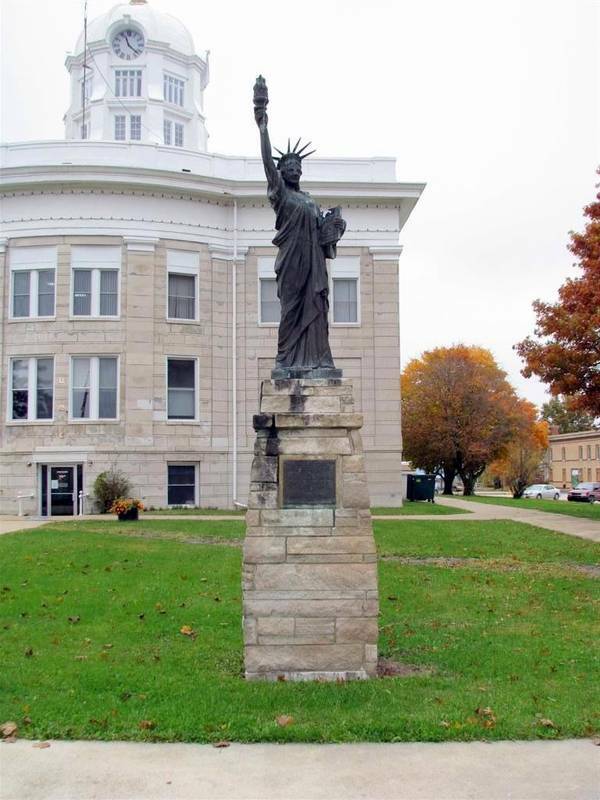 This statue, which is located in Springfield, Michigan, is one of 200 aftershocks were scattered throughout the US in the early 50 This is before the "Greene County Courthouse," a kind hotel the local department. It is well placed on a high pedestal that magnifies. 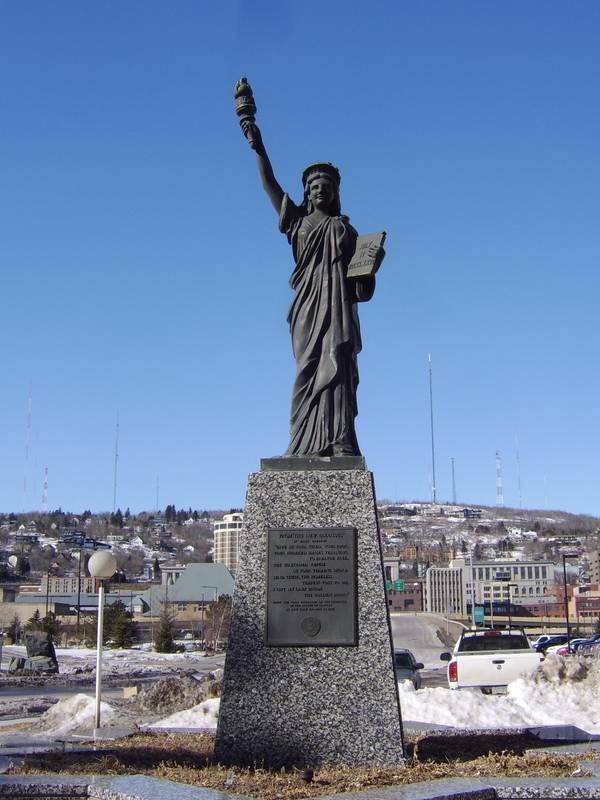 Replica of the statue of Liberty at Duluth (Minnesota, United States). Another statue of the Boy Scouts, but this one is particularly well preserved. It has the same flaws as the other since they all come from the same mold, but this one was repainted recently. Repainted and not renovated, as evidenced by one of the seven rays of the crown is missing. The pedestal on which it rests can compete at worst basis for all replicas of the World: A large block of concrete, it is pretty bad ... 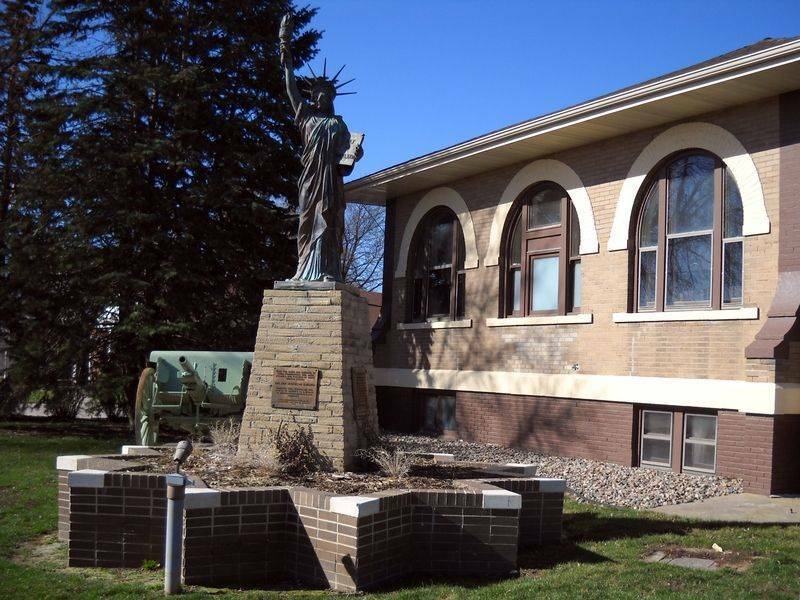 This statue is located in a park museum of the Chamber of Commerce of Lewistown, in Minessota. Nice statue youthful face, like the others, located between the stadium and Amzoil "Great Lake Aquarium". She's on a very successful carrier granite, star 11 branches, like the original. 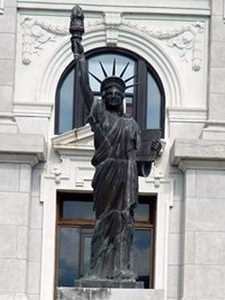 It was bought by Ray Bartholdi, cousin of Augustus, creator of the statue, who grew up in Duluth. This character, who lived in the city around the 30s and into the 70s, wanted to bequeath to scouts of her city but the operation could not be done. He ends up yielding 11 December 1976 to "Children of Duluth" for the bicentennial of the nation. 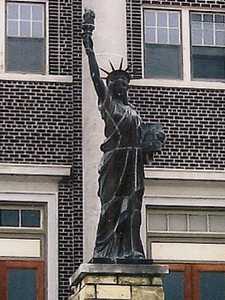 Replica of the statue of Liberty at Hibbing (Minnesota, United States). 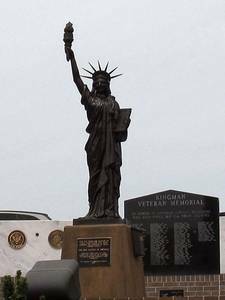 "Dedicated to Donald Kozlik, For service beyond the call of duty as a Boy Scout and soldier of her country. His Boy Scout good turn included five years daily service to a blind man, 1946-1951. He served with the U.S. Army from 1951 until he gave her life for her country on a battlefield of Korea, July 18, 1952. Dedicated by Hibbing Knights of Columbus." 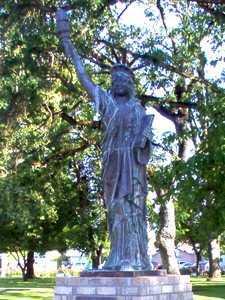 Replica of the statue of Liberty at Boonville (Missouri, United States). 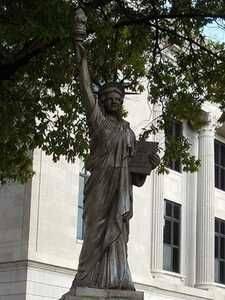 This replica covered with copper plates is in the street, to the west entrance of the court Cooper County, at 200 Main Street, Boonville (Missouri) She's on a pedestal showing its age and will deserve a good restoration. 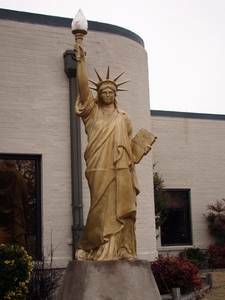 Replica of the statue of Liberty at Concordia (Missouri, United States). 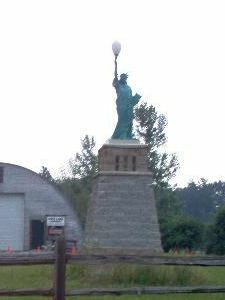 This is in Concordia, Missouri, that is the reproduction of the Statue of Liberty. It is at the corner of 7th South and Gordon Street, Central Park, Concordia, in Lafayette County. It was set up like the others during the early 50s. 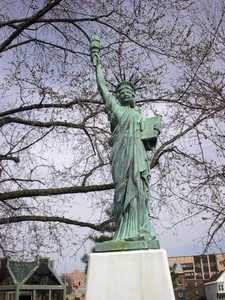 Replica of the statue of Liberty at Memphis (Missouri, United States). 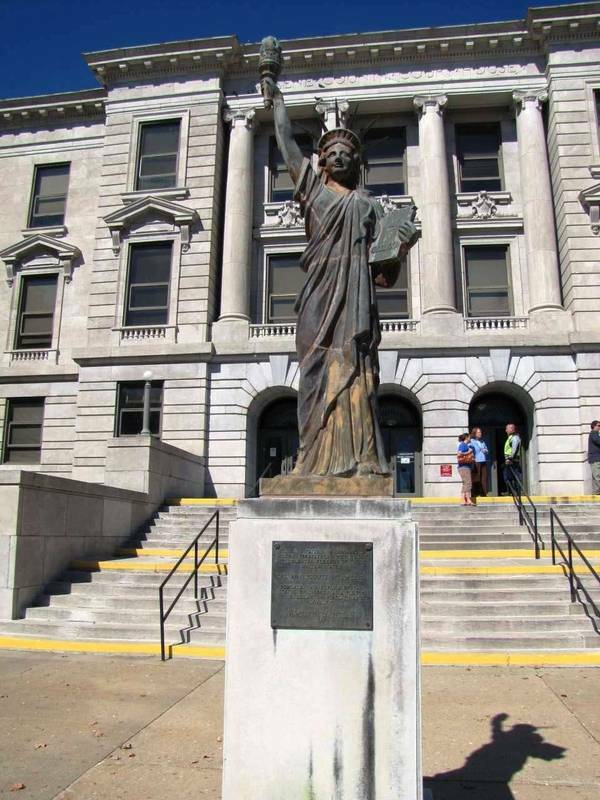 Located on the lawn of the "Scotland County Courthouse" Memphis, Missouri, this statue is one of those set up during the campaign of American Boy Scouts in 1950. It does not stand out from others, it is a little worn, but nothing more. It is highlighted by a rather imposing dry stone pedestal. 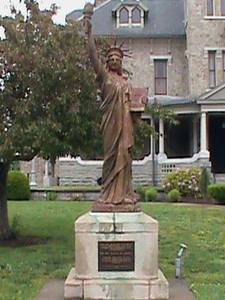 Replica of the statue of Liberty at Sedalia (Missouri, United States). 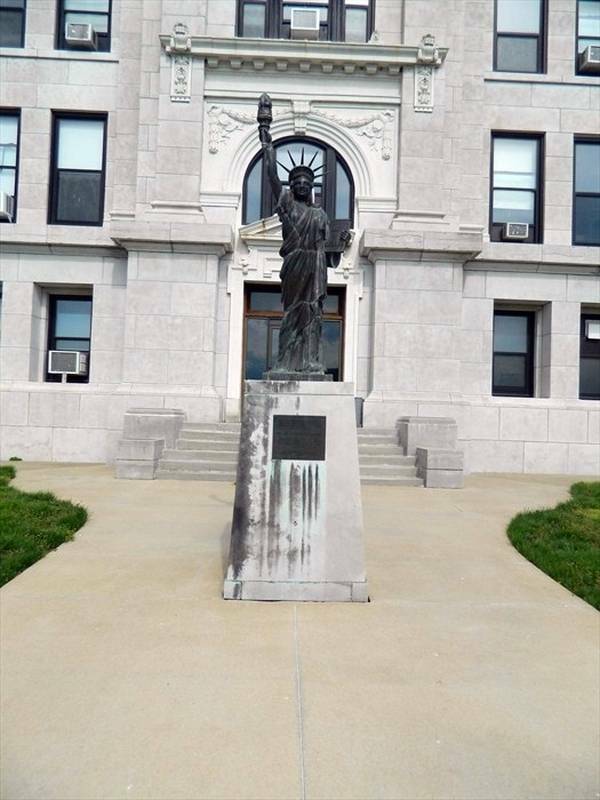 In the city of Sedalia, Missouri, the visitor can easily see this Replica of the Statue of Liberty in the park of Pettis County Court. It is exactly at the corner of Northwest Park. 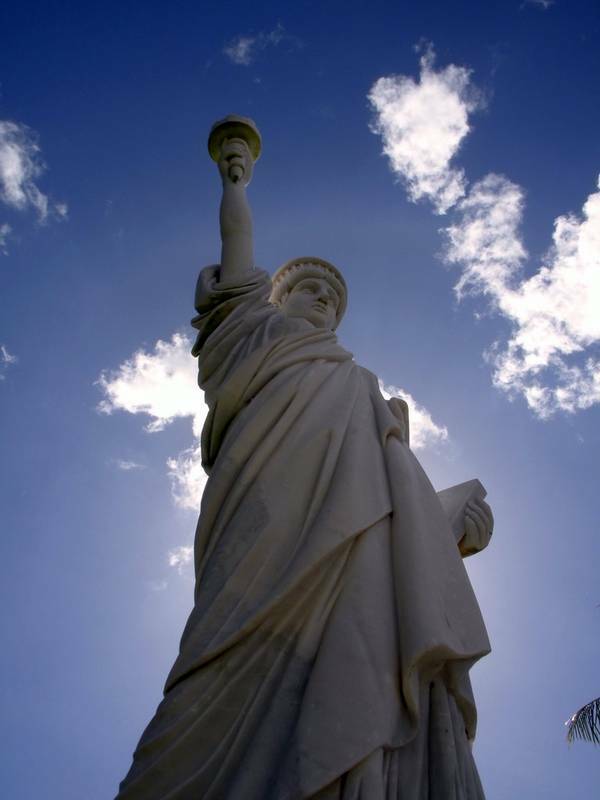 Replica of the statue of Liberty at Niagara Falls (New-York, United States). 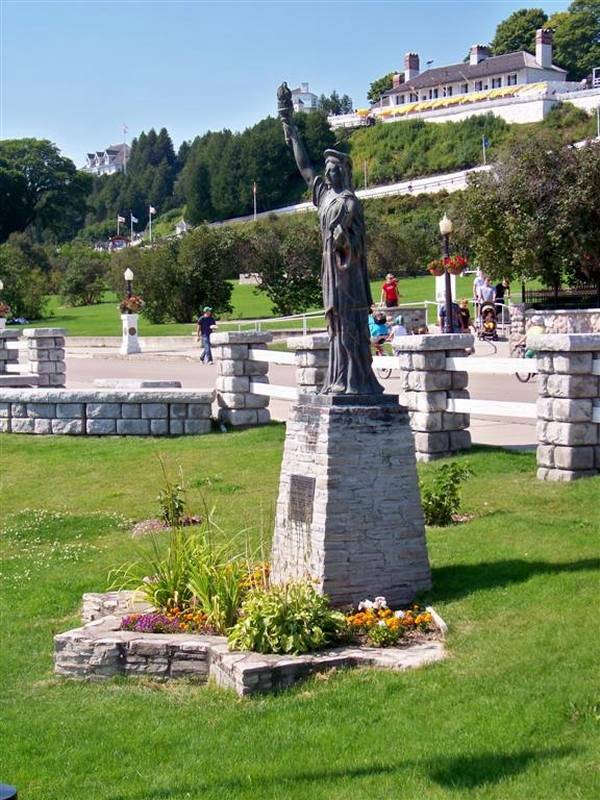 The statue of Niagara Falls was probably placed there to mark the entry to the United States because it is right at the entrance of the bridge leading to Canada, Rainbow Bridge (the rainbow sky Bridge) it is rather well development, on top of a small brick monument consists of a pedestal base and a star-shaped, like the original statue. Except that it has eight branches and the original statue is 11. 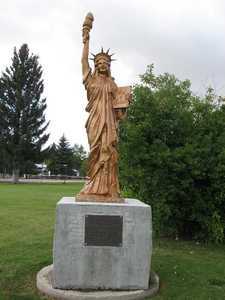 Replica of the statue of Liberty at LeRoy (New-York, United States). 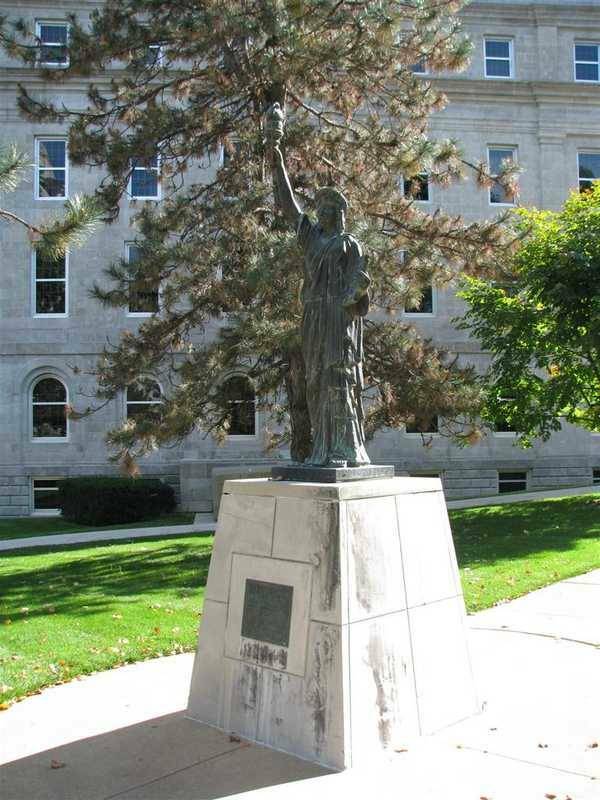 This copy of the Statue of Liberty was established during the campaign of American Boy Scouts in 1950. 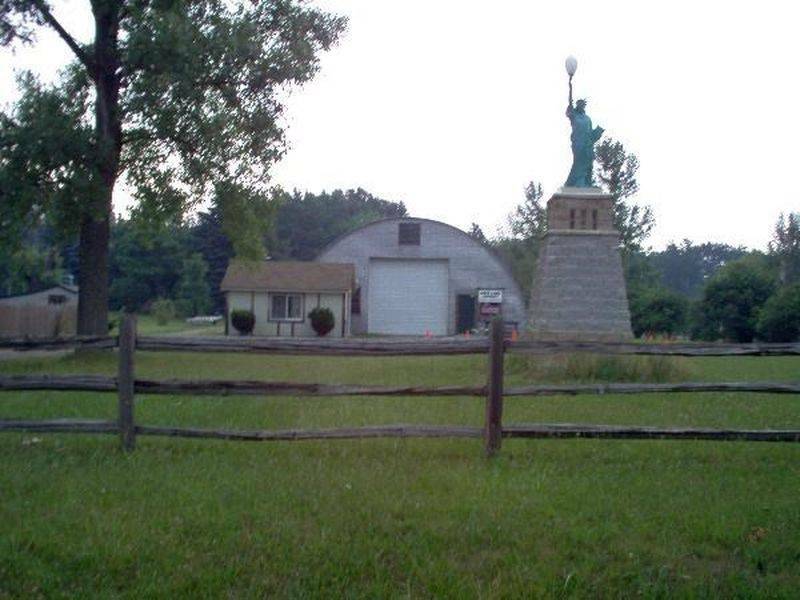 It is located in the town of LeRoy in Genesee County. 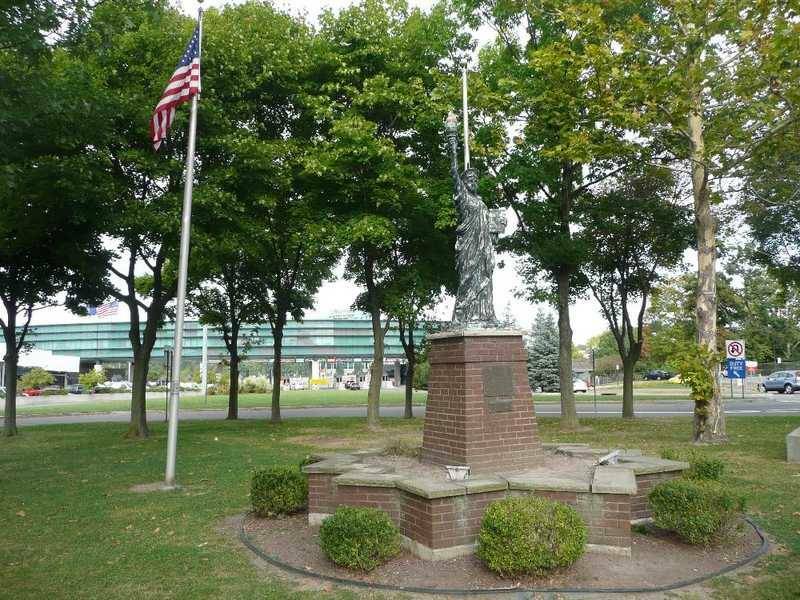 The city lies at the edge of Oatka Creek, the statue was put on the quayside, on a grassed area and perfectly maintained. There is nothing special to say about the statue itself, if only it was opened twice, first in 1950, second in 1980, following restoration. 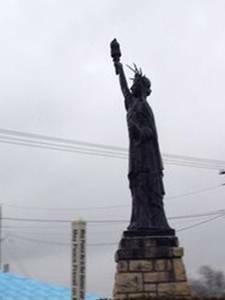 Its pedestal is quite small, but it has the famous star-shaped fort that matches the Wood on which was built the real Statue of Liberty. 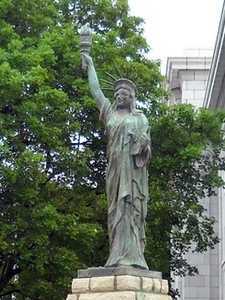 Replica of the statue of Liberty at Schenectady (New-York, United States). Another outcome of the campaign replica of American Boy Scouts in 1950. It was offered by the Block family and the local newspaper. It is located in Camp Miakonda facing the Scout office in Toledo Ohio. 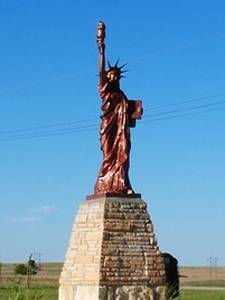 Replica of the statue of Liberty at Blackwell (Oklahoma, United States). 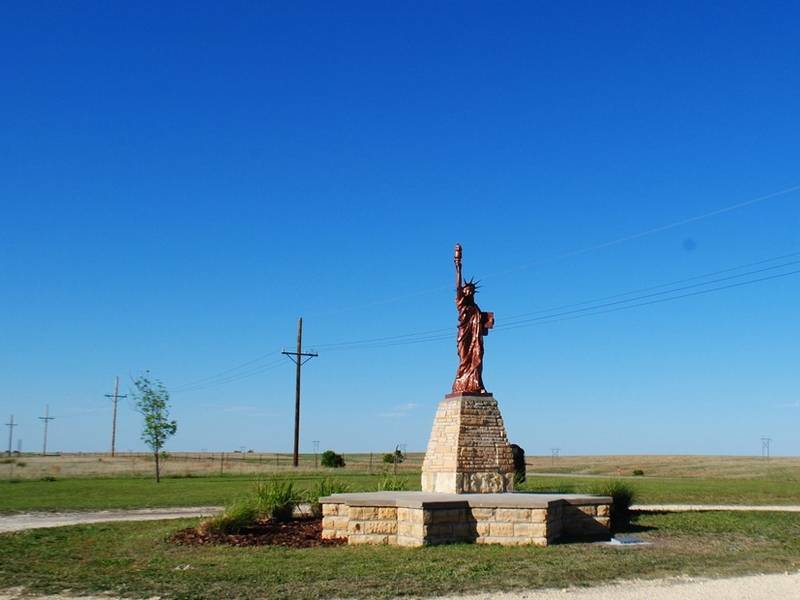 This reproduction of the Statue of Liberty is located in the town of Blackwell, Oklahoma. Its exact location is at 1400 South Main Street, on the lawn of the pool, Blackwell memorial. This is a typical image of the campaign scouts of 1950, with its qualities and defects. 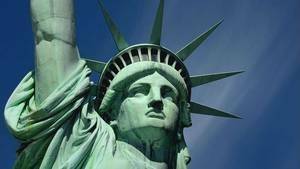 It is atop a large exposed stone pedestal of trapezoidal shape, pedestal that is itself on a pedestal in a star shape, as is Fort Wood on which the real Statue of Liberty is located. This copy is rather good quality and well maintained. 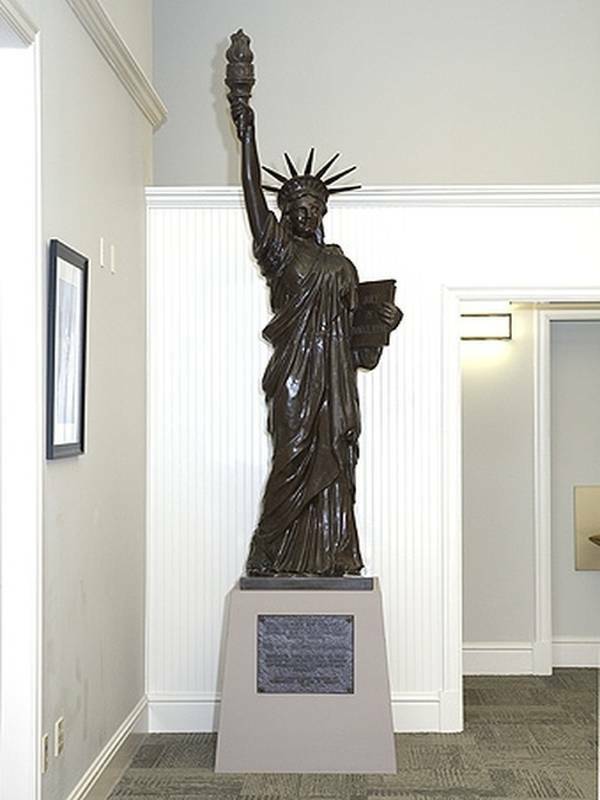 Replica of the statue of Liberty at Edmond (Oklahoma, United States). 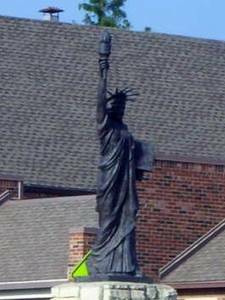 This photo dates from 2009, it shows the Statue of Liberty Edmond, Oklahoma. Initially installed in the park Edmond Library, it was moved at a strategic crossroads in the city following the park's renaming "Shannon Miller Park", named after the native Olympic Sports of the city. It is nowadays at the intersection of Boulevard and 2nd Street. This is an issue statue of the campaign "Strengthening Freedom arm", initiated by the American Boy Scouts in 1950. Replica of the statue of Liberty at Enid (Oklahoma, United States). 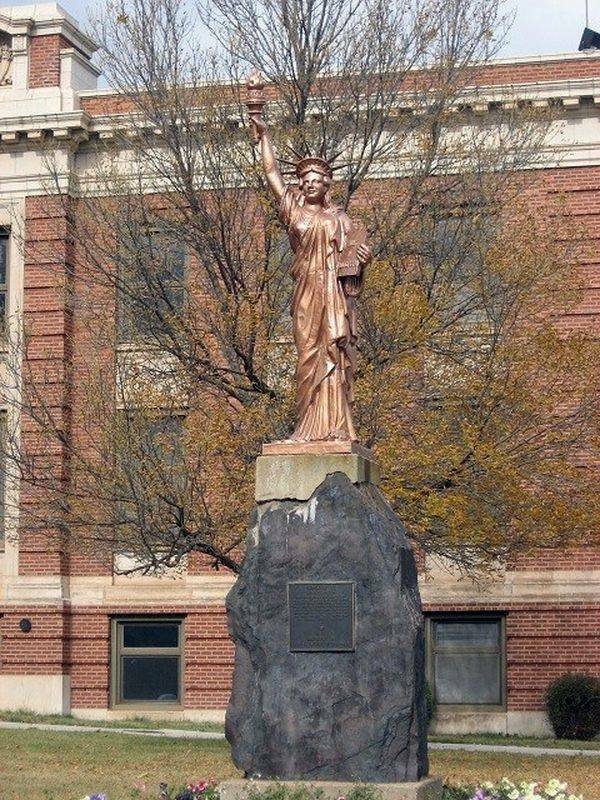 In Oklahoma is another statue implementation during the campaign of American Boy Scouts in the early 50s: She is in the city of Enid, on the lawn of the County Hall. 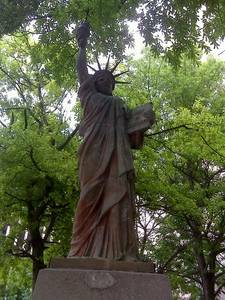 It is part of a set of statues recalling the past history of the United States. Its exact address is Grand Avenue side, Courthouse lawn, Enid, TX. 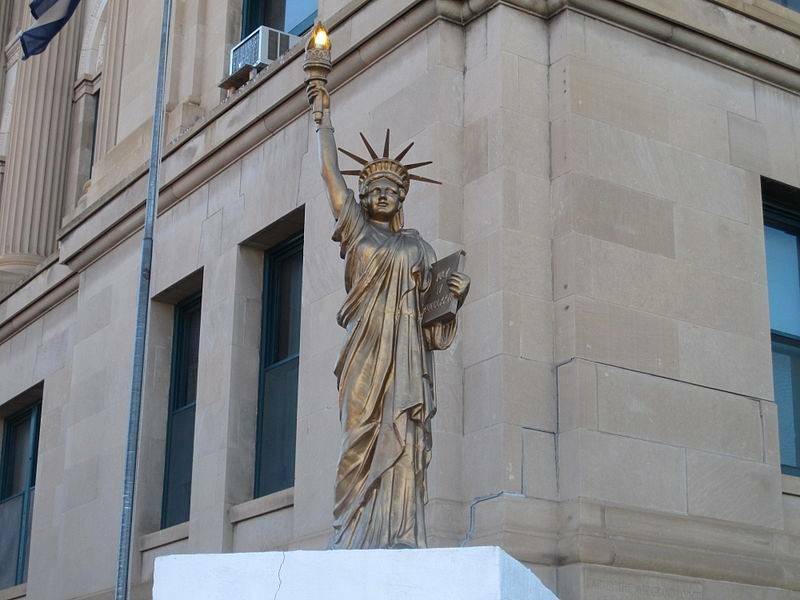 Replica of the statue of Liberty at Norman (Oklahoma, United States). 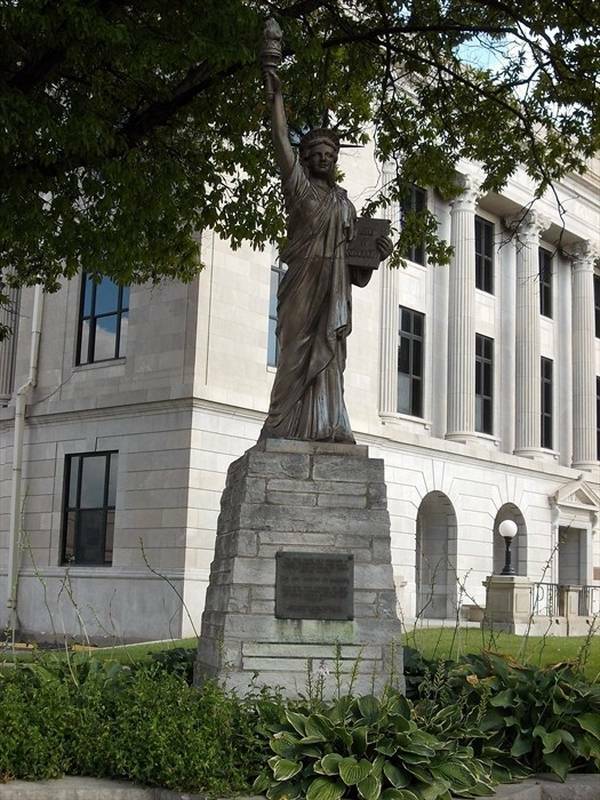 There are many replicas of the Statue of Liberty in Oklahoma. It is in the city of Norman, to Eufala and Peters. It is located exactly at the entrance of the law firm Bailman Bonds. It measures 10 feet high, 2 feet base. It is golden in color and holds in her right hand a torch turned into luminaire. It is not particularly consistent, it takes the tablet a bit too far from the body, and the torch was not on call, but other than that it is not so bad. It may have taken a bit of weight ... but nothing serious. 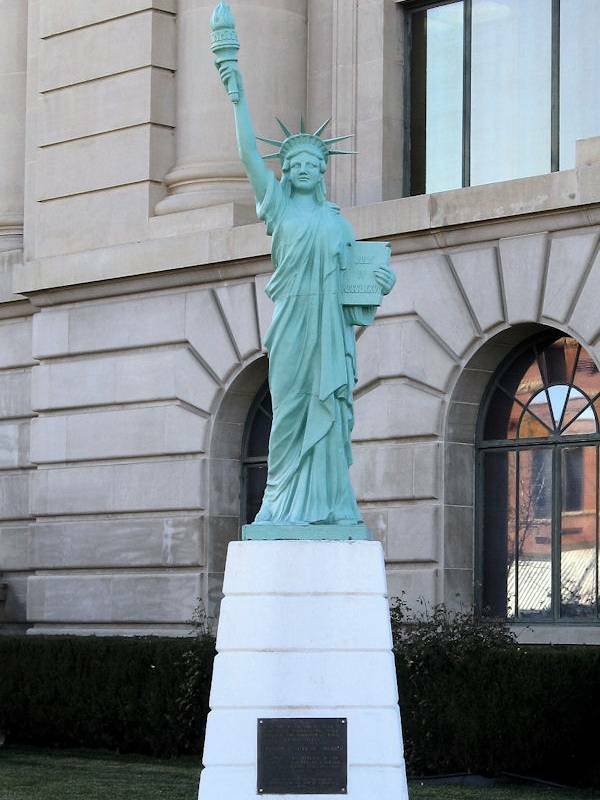 Replica of the statue of Liberty at Oklahoma City (Oklahoma, United States). 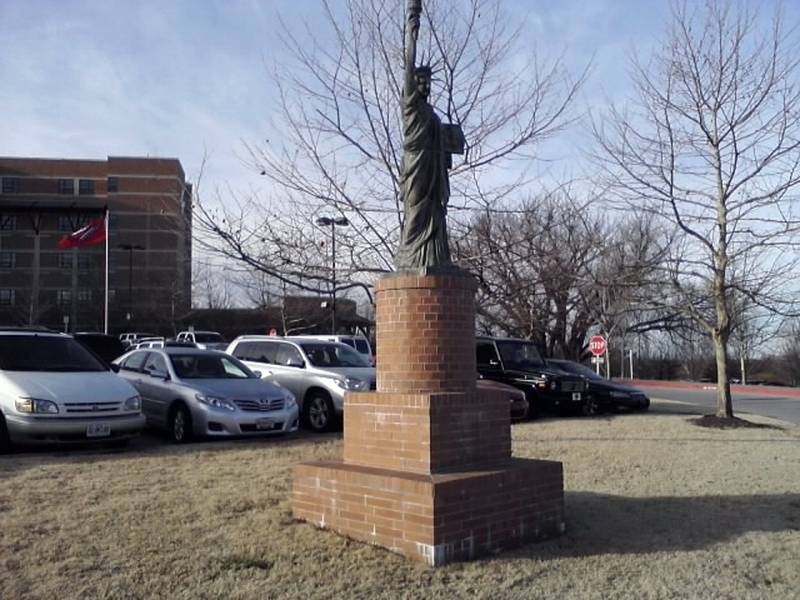 There are many replica of the Statue of Liberty in Oklahoma, but this is the first encountered in the capital Oklahoma City. It is in the park in front of the county courthouse, under the foliage. 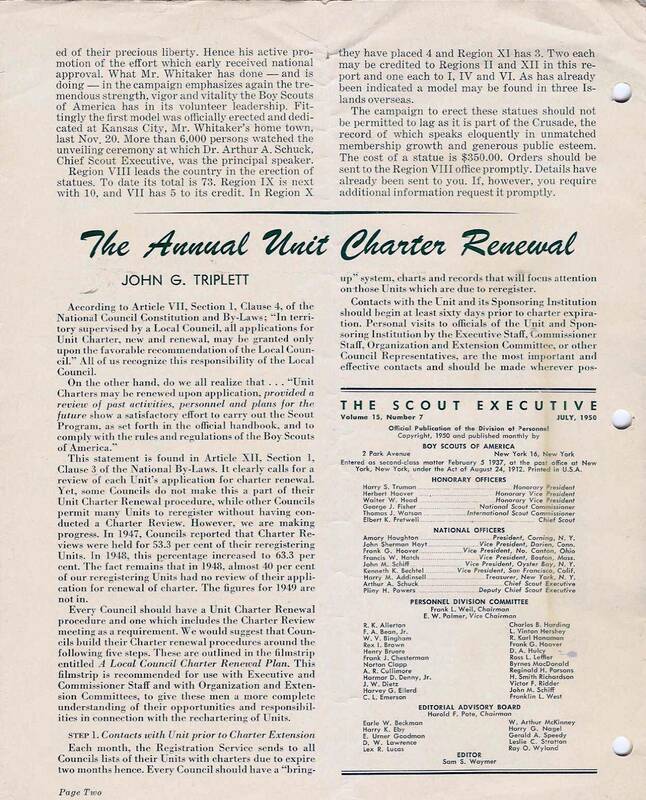 This is one of many copies of the campaign of 1950 scouts. 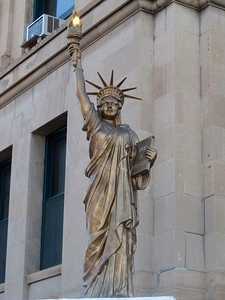 Replica of the statue of Liberty at Tulsa (Oklahoma, United States). In Oklahoma there is another replica of scouts in the city of Tulsa, at the intersection of East 17th and Harvard. She is on a pedestal enough taxable beige stone has the characteristic of being itself a star-shaped base that mimics the strong Wood, the former military fort downgraded on which was installed the real Statue of freedom. 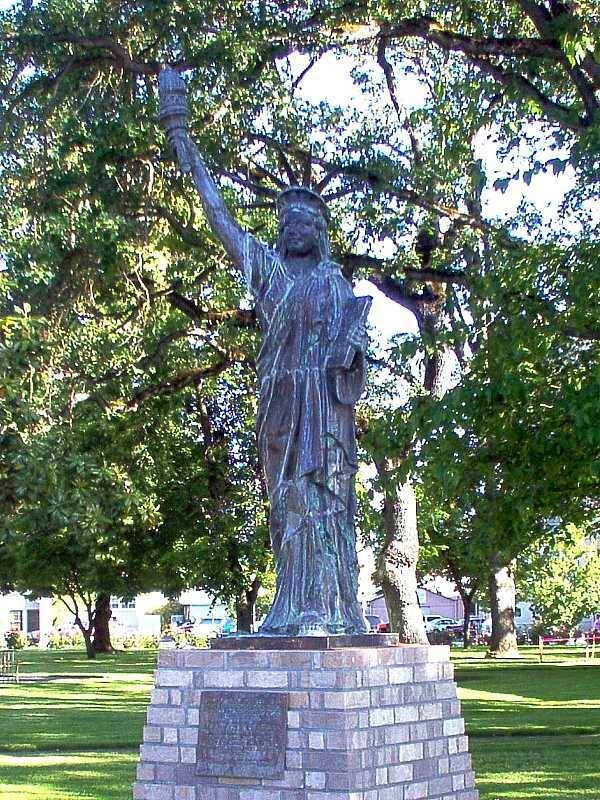 Replica of the statue of Liberty at Medford (Oregon, United States). 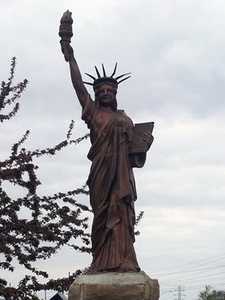 Replica of the statue of Liberty at Berwick (Pennsylvania, United States). Once reproduction of the Statue of Liberty after the campaign launched by the American Boy Scouts in 1950. It was inaugurated in 1951. It is located on the lawn of the Mansion Jackson at 344 Market Street in Berwick, Pennsylvania. It is perched on a pedestal pretty model, which is rare, stone, cubic. It is rather well preserved. 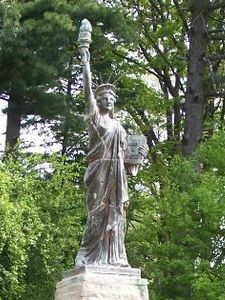 Replica of the statue of Liberty at Ellwood (Pennsylvania, United States). 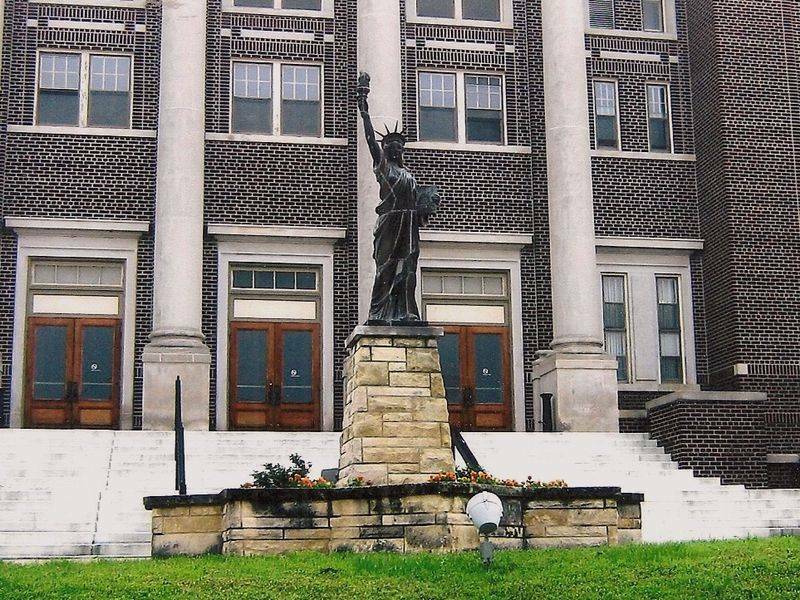 The city has a statue of 1951, she is the "Lincoln High School" between 5th Street and Crescent Avenue. She is on a trapezoidal base rather high, red brick. 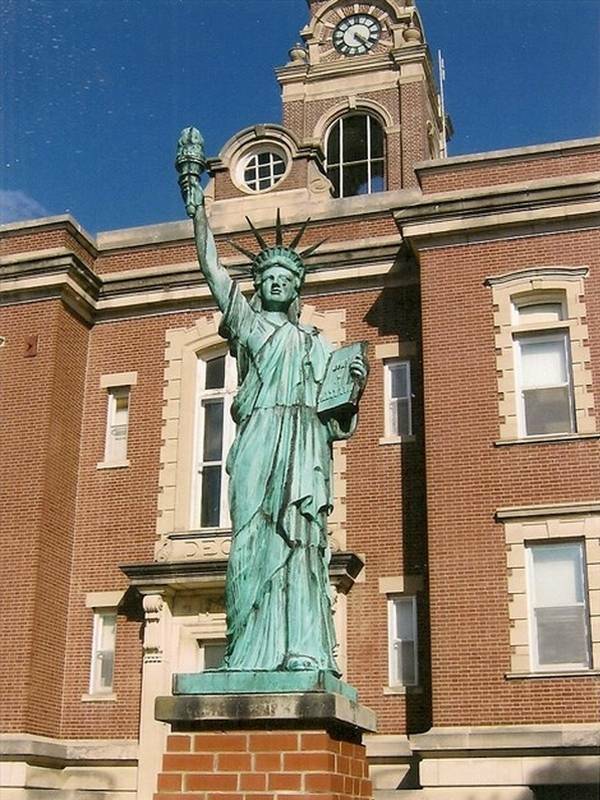 Replica of the statue of Liberty at New Castle (Pennsylvania, United States). 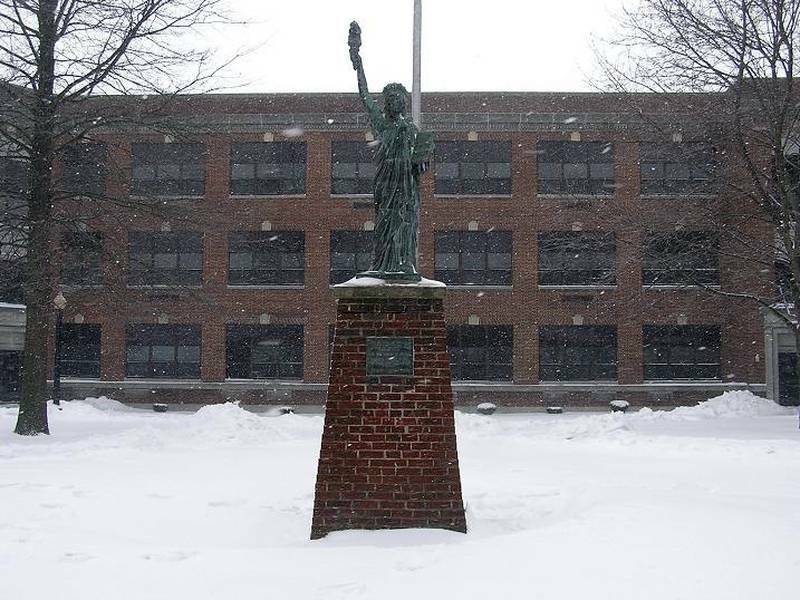 Small town in Pennsylvania, the Statue of Liberty is at the corner of Mill and Grove Street. It is a bit damaged. 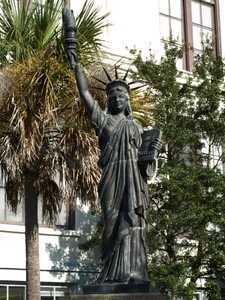 Replica of the statue of Liberty at Columbia (South Carolina, United States). This copy is located in the lobby of "Gentry City Building" at 1 S. Seventh Street. It was moved in 2007, before she was on Broadway, right next door. This location is temporary, it's just time to find another public location. 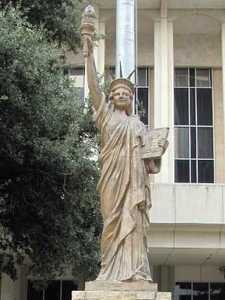 Replica of the statue of Liberty at Austin (Texas, United States). 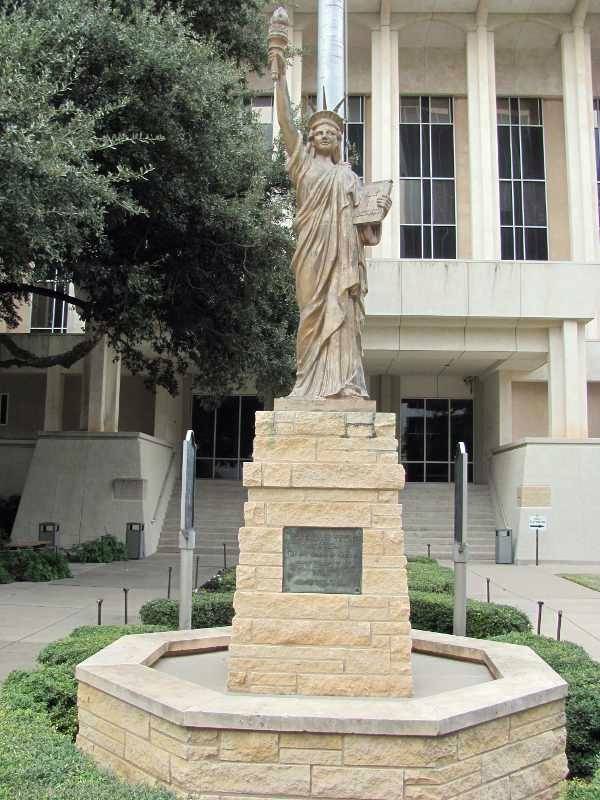 It's in Austin that ended this Statue of Liberty Boy Scouts of America, built in 1951. 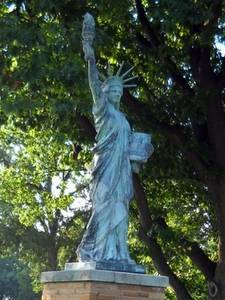 It was moved to the park in the south on a new pedestal, north of the city, in 1997. on this occasion the capsule that was buried under the monument was recovered and handed over to the "Capitol Area Council." He was re-buried in the Boy Scout camp near Bastrop, in early 2008. A plaque stresses that it should only be opened in 2076. It is similar to other replicas of that time, but it is rather well preserved. She is on a rather high pedestal in white stone, himself raised by a marble base. Usual plaque commemorating the operation "Strengthen the Arm of Liberty" is affixed to the base. 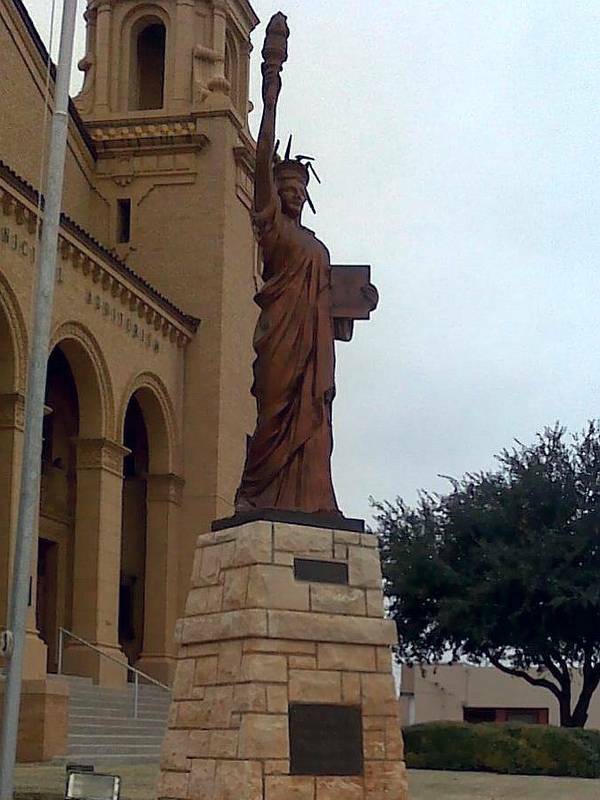 Replica of the statue of Liberty at Big Spring (Texas, United States). Enthroned at the entrance to the municipal auditorium in the city of Big Spring, Texas, this reproduction of the Statue of Liberty is one of the 200 installed by American scouts in 1950, and the first time in Texas . It was donated by Mr. and Mrs. Tom Good, a couple of farmer, in memory of their son Jake died in 1928. The inauguration ceremony was held April 28, 1950 at 16:30 in the lobby of the auditorium Big Spring , succeeding a parade of 800 Boy Scouts and their leaders from 17 different countries. The host of the ceremony was Nat Shick, Buffalo Trail Public Relations Council Chairman. 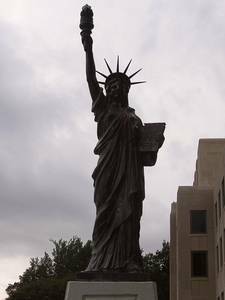 Replica of the statue of Liberty at Midland (Texas, United States). 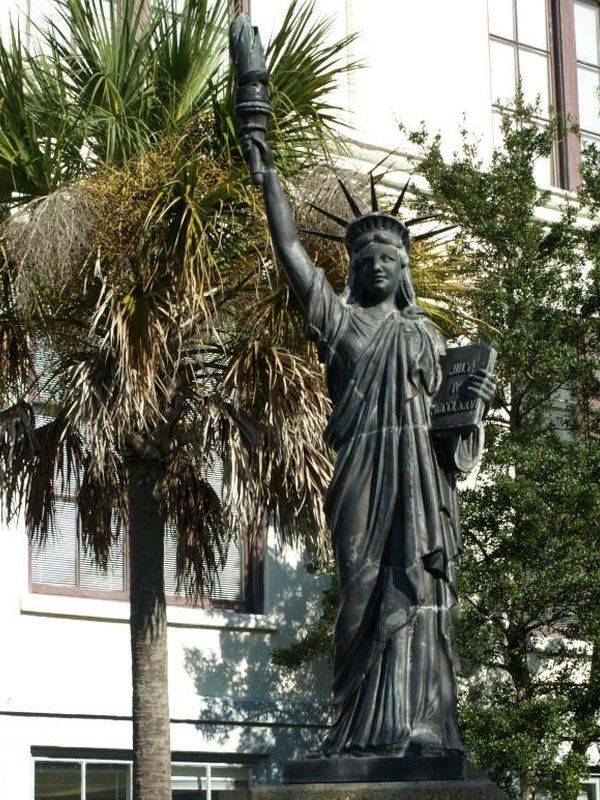 Replica of the statue of Liberty at Port-Arthur (Texas, United States). The replica of Port Arthur, Texas, is located on the campus of Lamar State College. This is one of the 200 replicas implemented by scouts in the early 50s, everywhere in the US. It was installed in the park, on a pedestal imposing white stone pedestal that is itself surrounded by a sort of star-shaped base with 5 branches. 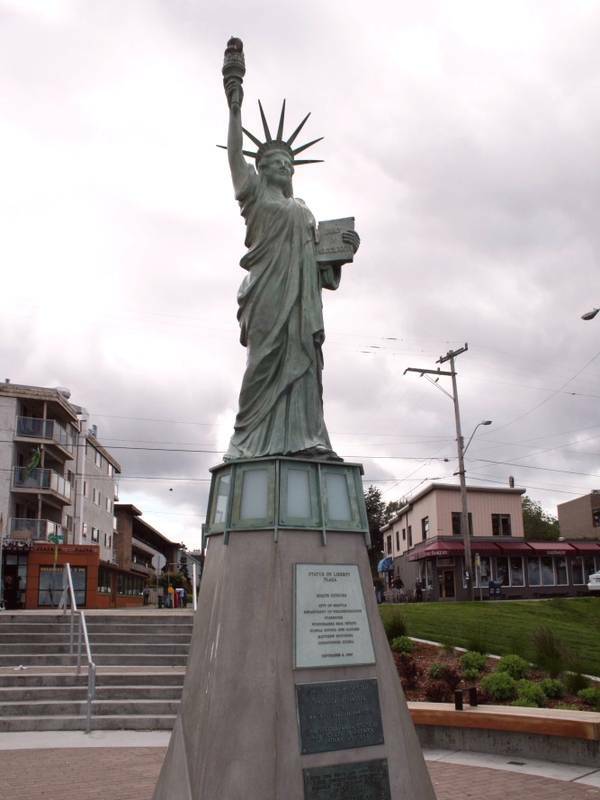 Replica of the statue of Liberty at Alki (Washington, United States). It is since 6 September 2008 that the statue is installed at Alki, in the state of Washington. It is located on Liberty Plaza, of course ... Its curiosity of having a concrete base pyramidal ending with a canopy, there is probably a light source inside. Scouts from the sea and scouts Seattle erected our "Little Sister of Liberty at Alki beach here in 1952 following the national campaign for the 40th anniversary of American Boy Scouts. 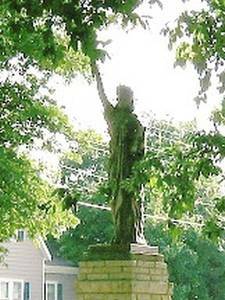 This campaign, led by Jack Whitaker, responsible scouts Kansas, encouraged the boy scouts of all America to place statues in their communities as a souvenir of Liberty values. Between 1948 and 1952 more than 200 aftershocks at 1 / 8th have been installed in 39 states and other US territories. Over time wind, sea water and sea salt deteriorated copper covering that of Alki. In 1990 he was sought donations for the repair and possibly replace. In 2004 a new effort was made by selling engraved bricks symbolic during the renovation of the square. 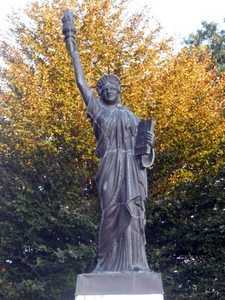 In 2006 the statue was rebuilt with the bronze Tacoma. Other fundraising enabled the completion of the square. The new site was inaugurated September 6, 2008. 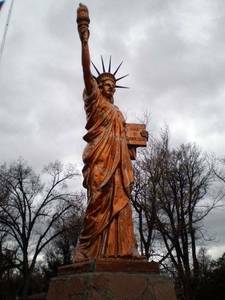 Replica of the statue of Liberty at Leavenworth (Washington, United States). This statue of boy scouts is in Washington State, just in the city of Leavenworth. It is located in the park of the town hall, at 100 North 5th Street. It was inaugurated for a second time, probably after its restoration in 2002. Besides the plate located just below the statue list donors who generously contributed to its restoration. Its pedestal is beige brick, it is quite high, narrow. At its base there is a kind of base impressive star-shaped, as is Fort Wood, decommissioned military fort on which the statue of Liberty, the true. 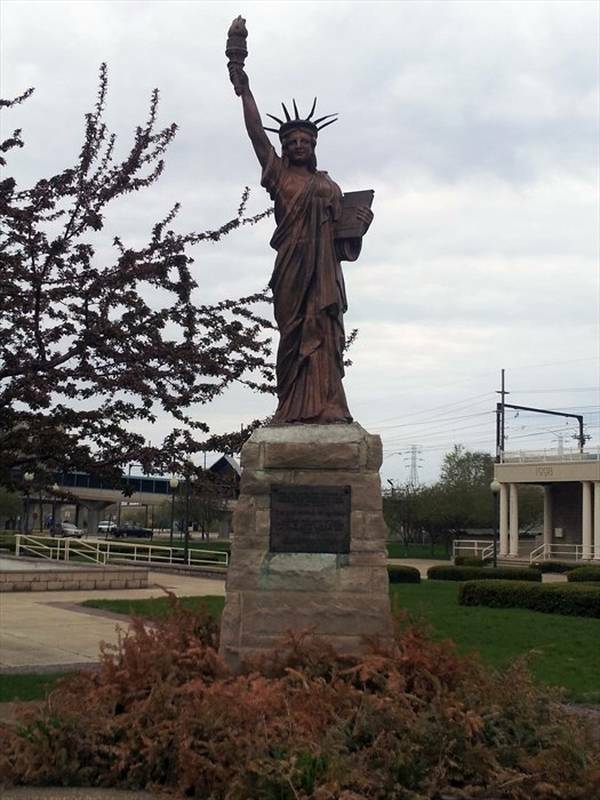 Replica of the statue of Liberty at Kenosha (Territoire appartenant aux United States). 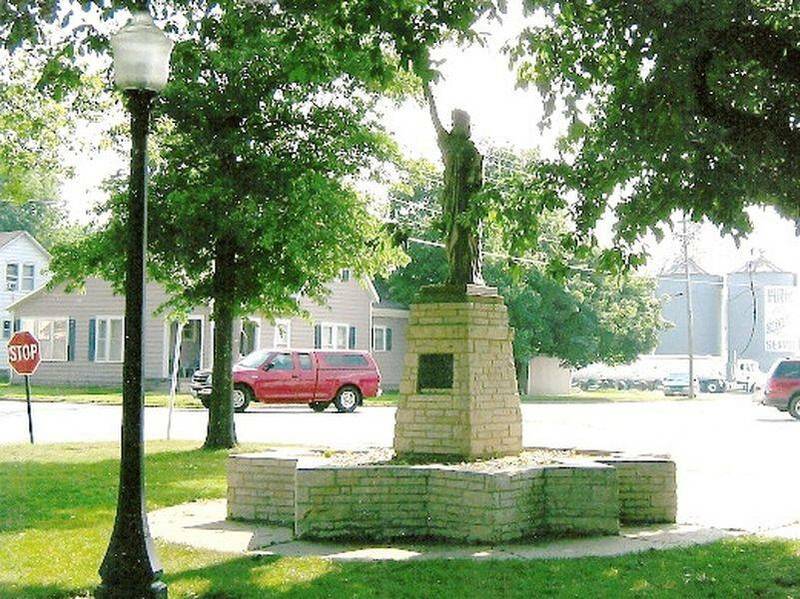 This statue was erected by the American Boy Scouts in 1950, she served in the commemoration of the centenary of the city of Kenosha where she is (Wisconsin). Exactly, it is the "Civic Center Park." This is probably one of the most damaged statues of the entire series, she badly last time and require renovation. The most significant and the loss of her crown of rays, but deteriorations at the toga, or torch itself is in bad shape. 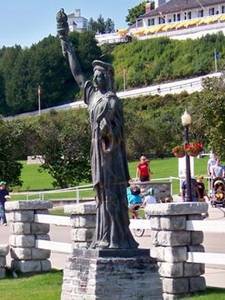 Replica of the statue of Liberty at Mackinac Island (US Territories). 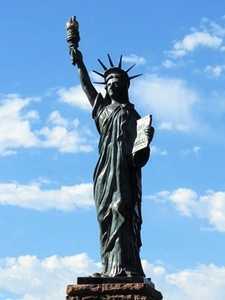 During the 1950 campaign the American scouts scattered statues of Liberty across the US territory. This included some overseas possessions including this one, Mackinac Island. This replica is identical to the other, there is nothing special except its pedestal as often installed on a star-shaped structure, which is included here partly underground, the ground is slightly sloping. Mackinac Island is an island in Lake Huron, to the Canadian border. 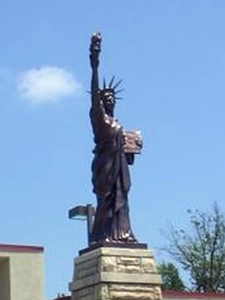 Replica of the statue of Liberty at Paseo de Susana (Guam, United States). A statue of boy scouts, dating from 1950, was fought in this small American territory in the Pacific. It is located in Paseo de Susana, the port entrance and faces the boats arriving. Its environment is paradise, with large green lawns, palm trees, etc.